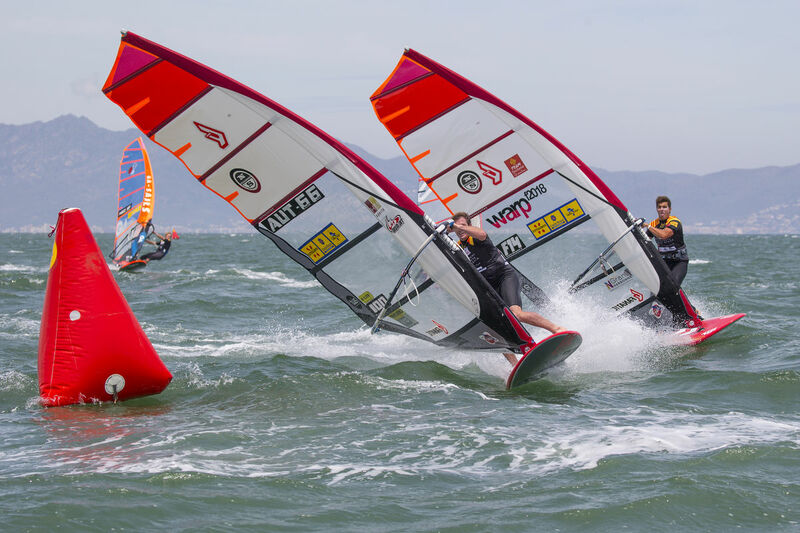 The final day of the 2019 Marignane PWA World Cup provided another stern test of the crew and sailors patience, but eventually, their perseverance was rewarded as results were crucially gained in both the men’s and women’s fleets after a long day on the water. In fact with the wind being so inconsistent, it took 6 painstaking hours to complete just 8 heats. The end result will prove hugely popular with the home crowd thought with local heroes Delphine Cousin Questel (Starboard / S2Maui) and Pierre Mortefon (Fanatic / Duotone / Chopper Fins) taking the top spot on the podium in the first event of the year - giving them the early season title race lead heading into Asia. On the plane on the final day! 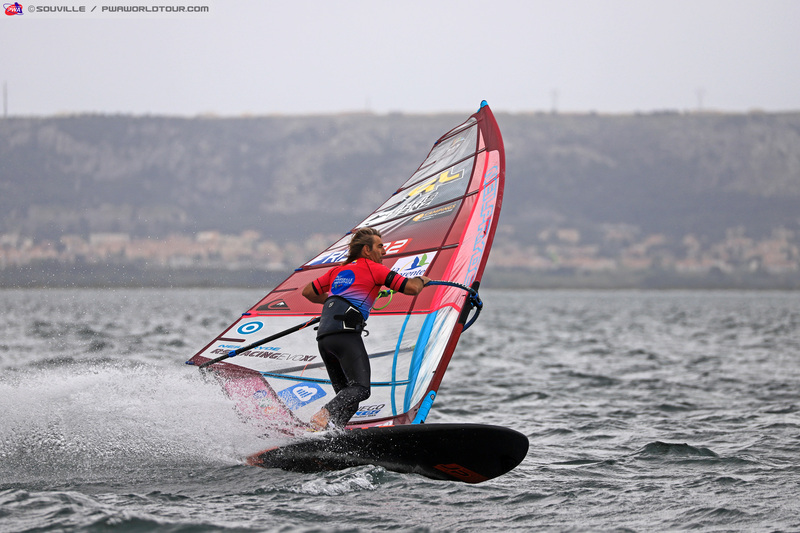 Reigning world champion - Delphine Cousin Questel - led from start to finish in the winners’ final as she made the perfect start to the season. The 3-time world champion didn’t put a foot wrong during the event and deservedly walks away as the champion, which means she extends her winning run to 5 consecutive events and she could prove a hard woman to stop based on that performance. Marion Mortefon (Fanatic / Duotone) chased home Cousin Questel, but couldn’t land a telling blow, however, the 27-year-old will still be delighted to have equalled her best result since Turkey 2015 - 2nd - and is prominently placed going forwards. Oda Johanne Brødholt (Starboard / Severne / Maui Ultra Fins) has been tipped as a slightly dark horse for the last couple of seasons and those fruitions came to life today as the Norwegian, who finished 3rd in the Freestyle in Bonaire, claims her first Slalom podium here in Marignane after producing a fantastic performance to hold off both Maëlle Guilbaud (Patrik / Loftsails) and Lena Erdil (Starboard / Point-7 / AL360 / Chopper Fins), who finish 4th and 5th respectively. We’ll take a look at the full results on Wednesday in the event summary. Before the final, the sailors were presented with a gamble to either stick with what they had or gamble on the wind picking up as per the forecast. 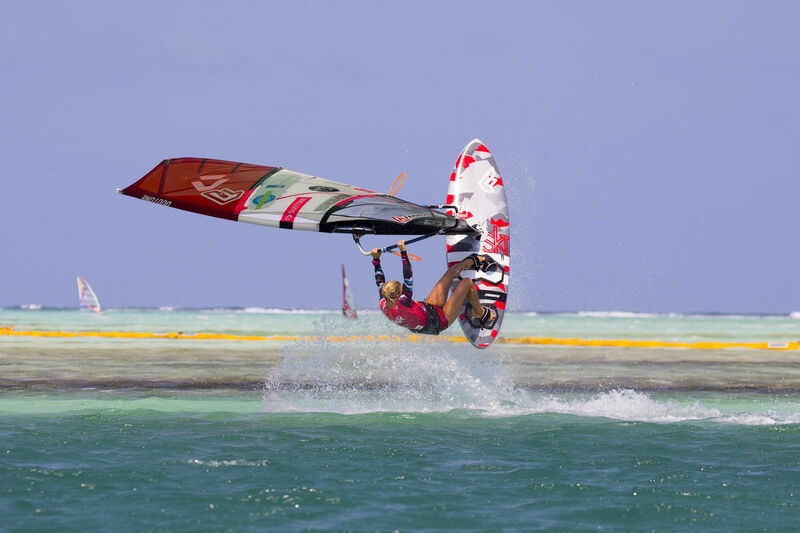 For those sailors who stuck - Antoine Albeau (JP / NeilPryde), Finian Maynard (FMX Racing) and Julien Quentel (Patrik / Gun Sails) - sticking on their big gear didn’t pay off as they became overpowered during the final with the wind picking up greatly. However, for Pierre Mortefon and Sebastian Kördel (Starboard / GA Sails), their gamble was rewarded with victory and a 3rd place with their greater control proving pivotal in the fight for the finish line. Mortefon and Albeau (JP / NeilPryde) enjoyed a great fight in the winners’ final, which could finally be completed at the third time of asking. On the first attempt, Malte Reuscher (Tabou / GA Sails) was disqualified for a premature start, while Bruno Martini (I-99 / Challenger Sails) suffered the same fate on the next attempt with the sailors pushing the start knowing that this was the final to decide the overall event rankings. It was Albeau who led around the first mark - a position from which he is rarely caught. However, with the wind picking up just before the start of the final AA was overpowered on his 8.6m, which presented Mortefon, who changed down just before the start of the final to 7.7m and medium board, with an opportunity to pounce and the two-time vice-world champion did just that as he produced a brilliant second gybe to move into the lead, which is one he wouldn’t relinquish as the 29-year-old powered away over the remainder of the course to make the perfect start to the season. Albeau played it relatively safe over the rest of the course to make sure he didn’t jeopardise his second place, which is a solid start to the season, particularly after changing board sponsor late in the close season. However, now he knows he is competitive again he will be once again be pumped up for another title challenge as he bids for World title No.25. The podium here in Marignane is completed by Sebastian Kördel (Starboard / GA Sails) with the German sailing brilliantly in the tricky conditions to earn his best Slalom result since September 2016. Kördel endured a tough season last year and will be delighted to have made such a positive start to the year. Last year’s World No.4 - Jordy Vonk (Fanatic / Duotone) - starts the season with a solid 4th place here in France, while Finian Maynard (FMX Racing) claims 5th ahead of Julien Quentel (Patrik / Gun Sails) - 6th - Bruno Martini - 7th - and Malte Reuscher - 8th. As with the women’s we’ll take a full look at the results in the event summary on Wednesday. After a long hard day on the water the winners were then presented in front of the crowd at 6pm during the closing ceremony! To stay up to date with all the latest developments from Marignane — including the live stream, elimination ladders, entry list, images, and live ticker simply click HERE and scroll to the bottom of the page. 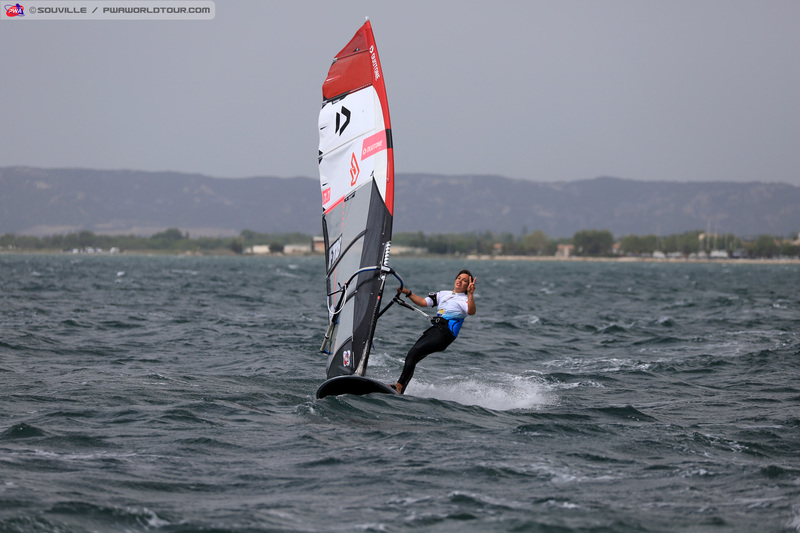 The waiting game continued on the penultimate day of the 2019 Marignane PWA World Cup as the light winds continued. A squall shortly after 1:45pm caused a flurry of action on the beach with the wind quickly picking up to 30 knots, but unfortunately the wind did not stick around for long. During the afternoon Taty Frans (Future Fly / Point-7), Adam Sims (Patrik / Sailloft Hamburg) and Diony Guadagnino (AHD / Loftsails) put on a tow-in Freestyle show to entertain the crowds. During the afternoon we caught up with Bruno Martini (I-99 / Challenger Sails), who booked his place in the semi-finals yesterday after winning his quarterfinal ahead of Ethan Westera (Tabou / GA Sails), Antoine Albeau (JP / NeilPryde) and Mateus Isaac (JP / NeilPryde). Hi Bruno, how was your winter training? “My training was really good. I spent 2 months in Tenerife where the training level was really high. We trained in both flat and choppy water and I feel like I improved a lot. I feel better and confident on my equipment - no matter whether it’s light or really strong wind." Yesterday you won your quarterfinal - how happy were you with your performance? "I’m really happy about that actually because it’s the beginning of the season and it’s nice to start in a good way being in the semifinals. The conditions were tricky, so it was not easy to race yesterday and it’s easy to get a bad result in one second, but on the flip side you can gain a really good result also." There's been a lot of waiting around for wind this week - how do you stay relaxed, but also focused for racing? There's only one day left of the contest - you must be praying for wind now with a top 16 spot guaranteed in the first elimination? Do you have an aim for the season? All the eggs are now in one basket with Monday offering the final roll of the dice to gain a result. The latest forecast models offer a chance to race late in the afternoon, but the wind is once again forecast to be offshore, which is the same as we’ve had for the whole week thus far. Hopefully, this time around it fills in. The sailors will meet for the skippers’ meeting at 8:30am tomorrow morning with the action commencing from 9:30am (GMT+2) - onwards. 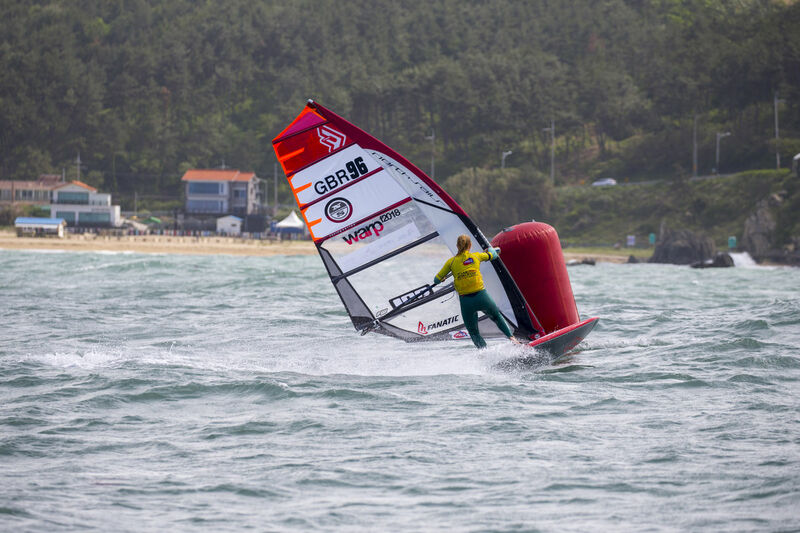 The wind teased the competitors for much of Day 4, but unfortunately despite several hours of effort only a further two heats were able to be completed in the men’s first elimination. 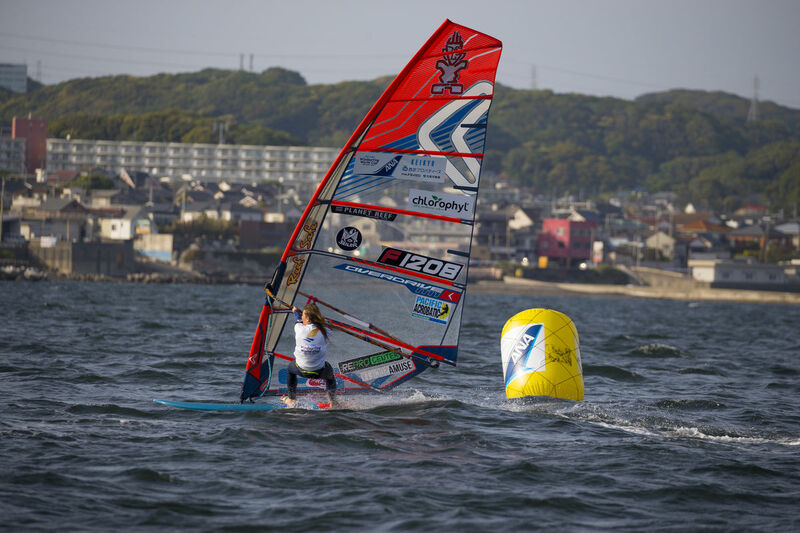 There were short periods of wind, but with the breeze continuing to blow offshore the wind remained very patchy, which made racing tricky to say the least. During the morning the 3rd men’s quarterfinal - Heat 11 - was completed at the third time of asking, having been cancelled for the first time on Day 2. Cedric Bordes (Tabou / GA Sails) and Valentin Brault (Simmer / Simmer Sails / Chopper Fins) were then disqualified from the rerun after jumping the gun, which left only 6 sailors vying for the top 4 positions. Jordy Vonk (Fanatic / Duotone) looked confident as he led from start to finish to book his place in the semifinal, while he was joined by Julien Quentel (Patrik / Gun Sails), Amado Vrieswijk (JP / Severne), who produced an excellent gybe at the first to leapfrog Antoine Questel (I-99 / S2Maui), while Sebastian Kornum (JP / NeilPryde) grabbed the final qualifying place. The Dane did well to overtake Questel heading to the third buoy and with the Frenchman under pressure he dropped his gybe allowing Kornum plenty of breathing room over the remainder of the course. It was also a case of third time lucky for Heat 12. Andrea Rosati (RRD / RRD Sails) and Mateus Isaac (JP / NeilPryde) both had to slam on the breaks before the start to avoid going over early and that left Rosati with no way back. 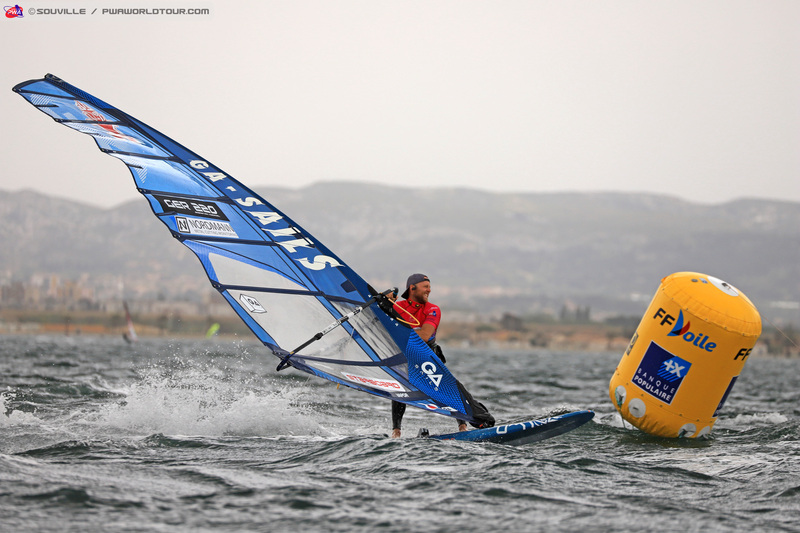 However, Isaac produced a brilliant comeback as he secured 4th place after Damian Arnoux (Simmer / Simmer Sails) clipped Arnon Dagan (Future Fly / NeilPryde) at the first gybe, which cost the Israeli a place in the next round. 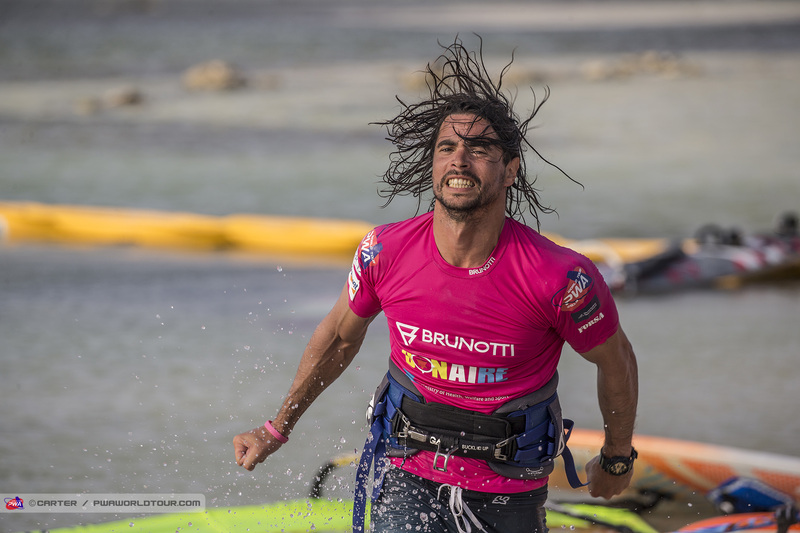 Bruno Martini (I-99 / Challenger Sails) claimed a clear cut victory to book his place in the top 16 as did Ethan Westera (Tabou / GA Sails) and reigning world champion - Antoine Albeau (JP / NeilPryde). The wind then dropped again and despite waiting until 7pm it never returned. 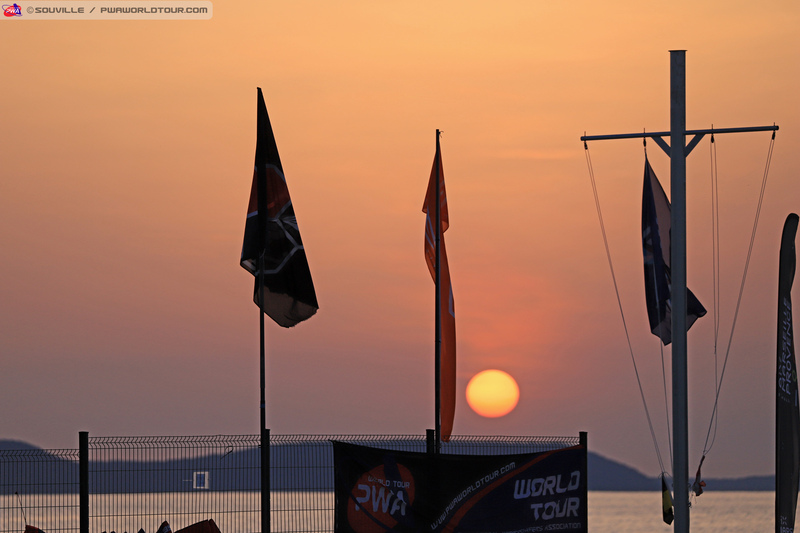 Tomorrow morning offers the chance of moderate offshore winds again, so the sailors will meet again at 8:30am for the skippers’ meeting with the racing commencing from 9:30am (GMT+2) onwards - if conditions allow. 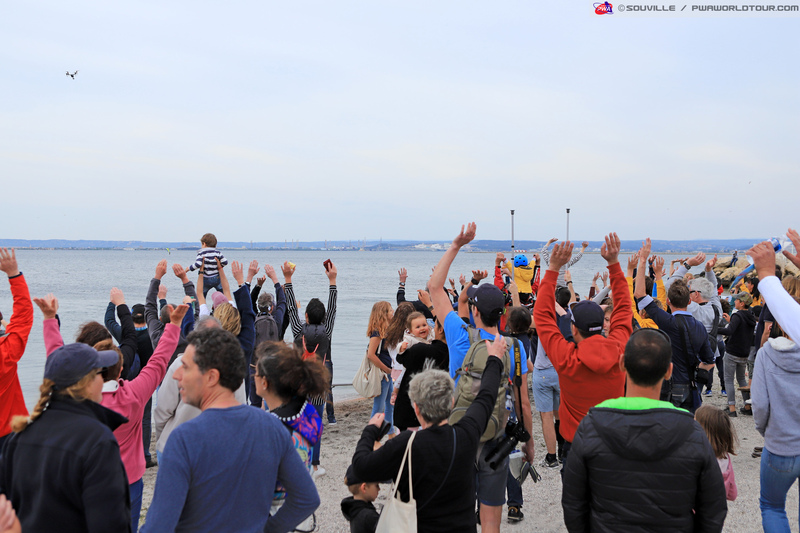 There were two contrasting forecasts for the third day of the 2019 Marignane PWA World Cup and unfortunately the model predicting less wind was the correct one. On several occasions the wind did appear as though it would kick in, but those periods of wind proved too brief to allow any further racing to be completed. While the wind remained light several sailors sneaked out on to the water for a bit of testing, while visitors to the event were able to bask in the warm sunshine. Saturday looks as though the wind will remain light, however, the forecasts for the prior days haven’t materialised so anything could still happen. On a more positive note both Sunday and Monday now offer potential for wind. The sailors remained on hold until 6:30pm, but with the wind showing no signs of improvement they were released for the day. The men’s and women’s fleet will meet again at 10am tomorrow morning for the skippers’ meeting with the racing commencing from 11am (GMT+2) onwards - if conditions allow. Aber ich selbst habe mir eine cobra 275 speed besorgt.für Nostalgie surfing. 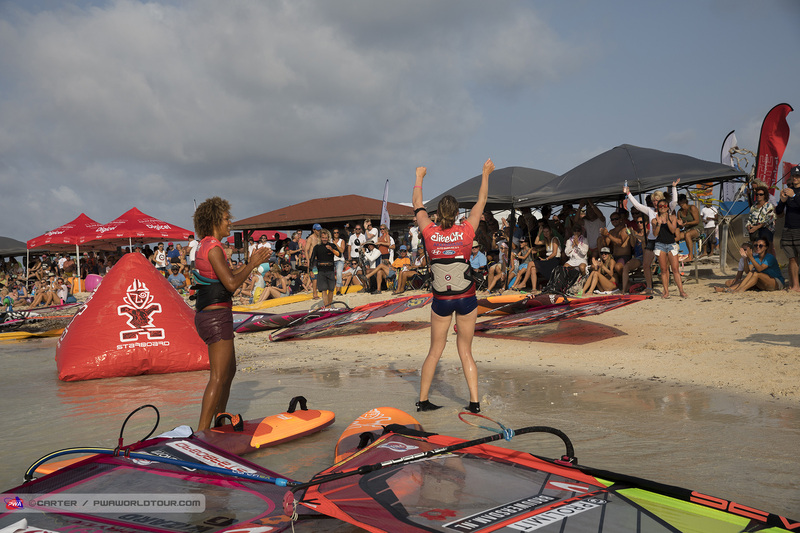 After a couple of hours of racing the first round of the women’s opening elimination was completed and all of the top seeds survived unscathed to book their place in the semifinals. 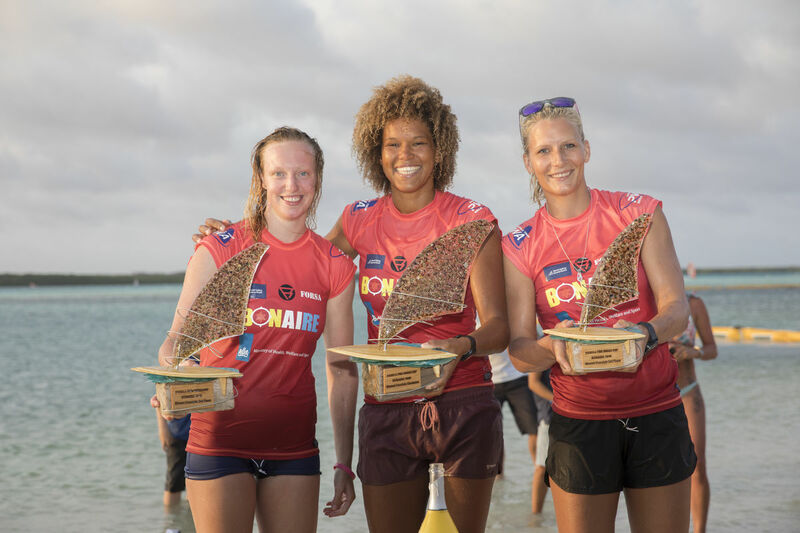 In fact, with Mio Anayama (Starboard / S2Maui), who finished 9th overall last year, absent here in France, Jenna Gibson (Fanatic / Duotone) was the only member of last year’s top 10, 6th overall in 2018, who failed to progress into the semifinals. The Brit was prominently placed in Heat 10 but dropped her opening gybe to miss out. Reigning world champion - Delphine Cousin Questel (Starboard / S2Maui), cruised through her opening heat, while vice-world champion - Lena Erdil (Starboard / Point-7 / AL360 / Chopper Fins), who is making her first appearance since breaking her foot last summer, also made a winning return in Heat 2. Meanwhile, last year’s world No.3 - Marion Mortefon (Fanatic / Duotone) - also made no mistakes in the opening heat of the day to progress. In the men’s opening elimination only the first 10 heats were completed before the wind shut down for the day, but during the course of those 10 heats, there were a number of upsets and talking points. In the first quarterfinal there was drama at the first mark as Enrico Marotti (JP / NeilPryde) appeared to sail directly into Maciek Rutkowski (FMX Racing), ending both of their hopes there and then. 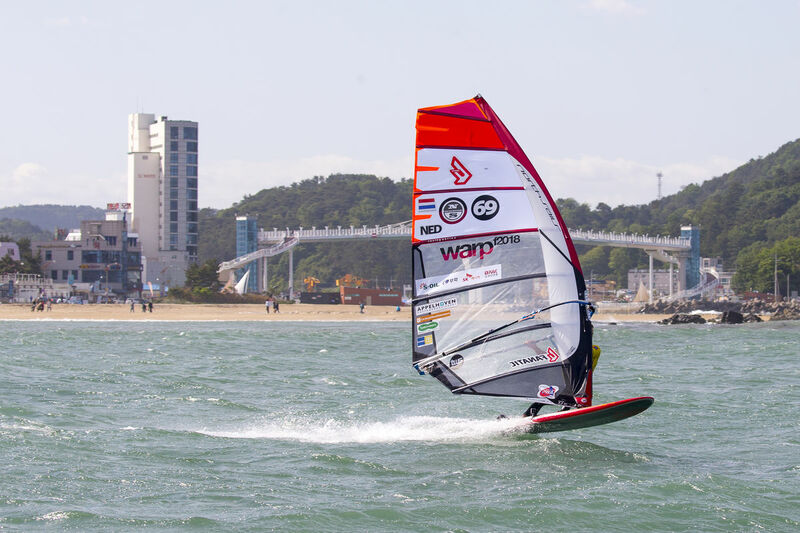 Elsewhere, last year’s world No.6 Ross Williams (Tabou / GA Sails / Shamal Windsurfing) was also eliminated in 5th place as Finian Maynard (FMX Racing), 20-year-old Basile Jacquin (I-99 / Point-7), Gunnar Asmussen (Starboard / Severne) and Pierre Mortefon (Fanatic / Duotone / Chopper Fins) all progressed into the semifinals. There was further drama on the run up to the start of the second quarterfinal - Heat 10 - as Pascal Toselli (JP / Loftsails / Chopper Fins) was involved in an altercation with Sebastian Kördel (Starboard / GA Sails), which resulted in the Frenchman falling and missing the entire heat. However, despite Toselli’s protests of dangerous sailing against Kördel, ultimately it was deemed a racing incident that required no further action and to rub further salt into the wound, Kördel would go on to qualify in 3rd place behind Nicolas Goyard (Tabou / GA Sails) and Marco Lang (Fanatic / Duotone), while 4th place was secured by Malte Reuscher (Tabou / GA Sails). Lang, meanwhile, who was making his first appearance since being forced to retire early last year in Fuerteventura made a winning return, despite breaking his elbow in the buildup to the event. The Austrian won both his second round heat and the quarterfinal to progress into the top 16 and looks as though he could be back to his best, and more importantly full fitness, after a long battle with a mystery virus. 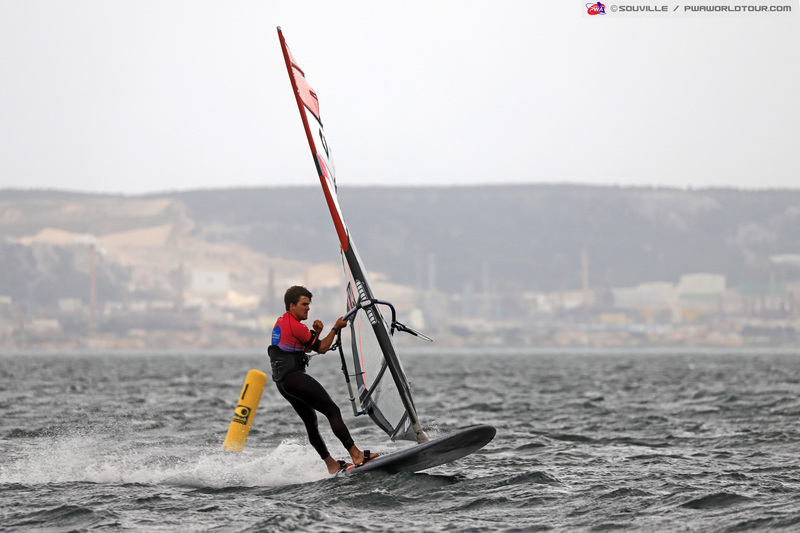 Heat 10 also involved vice-world champion - Matteo Iachino (Starboard / Severne / Shamal Sunglasses) - who suffered a shock quarterfinal exit in the opening elimination of the year. The Italian rarely complains about racing situations, but was clearly disgruntled that the second quarterfinal was allowed to stand as the 2016 world champion felt that the wind had dropped below the minimum threshold - Tristan Algret (Starboard / Severne / Chopper Fins) and Andrea Ferin (I-99 / Challenger Sails / AL360), who missed out in 5th and 6th respectively, were also of the same opinion. The third quarterfinal did begin, but was cancelled shortly after the first gybe with the wind dropping. The sailors then remained on hold until 6:30pm, but with the wind showing no signs of improving they were released for the day. There are contrasting forecasts for tomorrow with the latest WindGuru model predicting moderate to strong east-south-east to southeasterly winds for much of the day, while Windy forecasts only light to moderate winds - we will find out which one is correct tomorrow, but hopefully, it is the former. The skippers’ meeting has been called for 9am tomorrow morning with the racing commencing from 10am (GMT+2) - depending on the conditions. 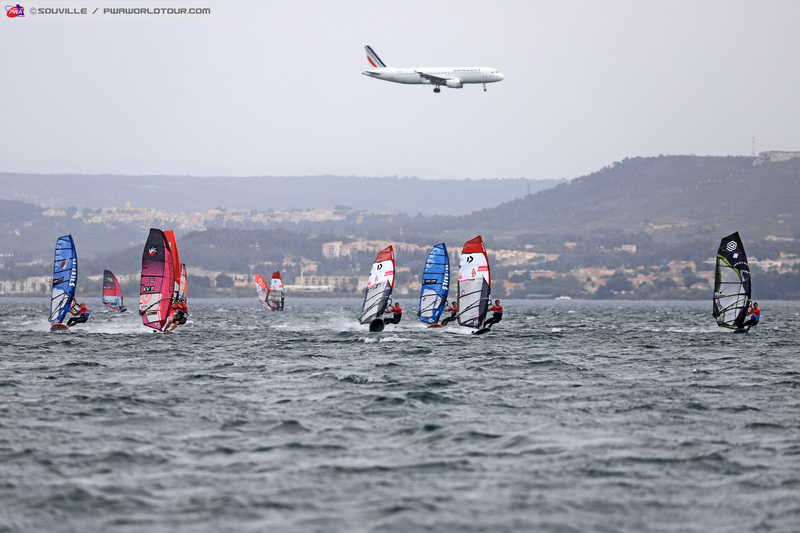 The opening day of the 2019 Marignane PWA World Cup saw the sailors receive a warm welcome upon arrival, but unfortunately the racing remained on hold with the wind teetering on the edge for much of the afternoon. That meant that several sailors ventured out on to the water to tune up a little bit ahead of tomorrow’s expected wind. 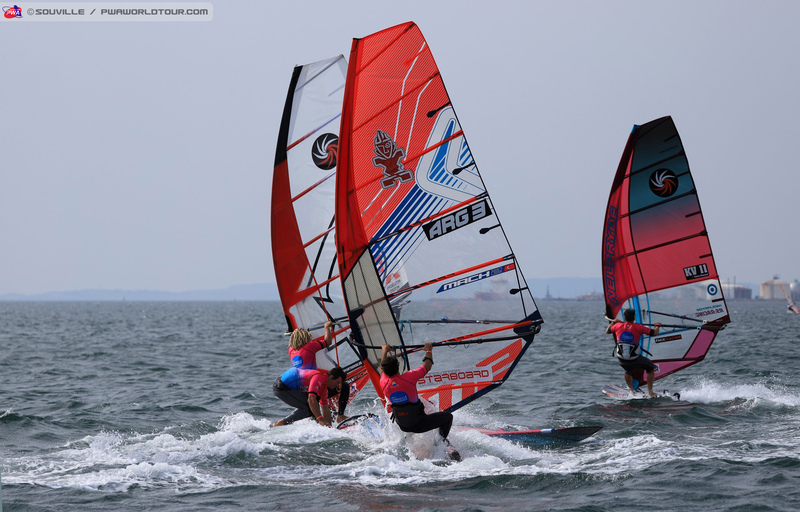 29 girls have signed up for the women’s contest, which is one of the biggest fleets in recent years, while there is a full 64-man fleet in the men’s division. With the wind remaining light the sailors were eventually released shortly after 5pm. FM: “FMX is my name - Finian Maynard - and X as in X-Factor. I like the way it rhymes together. The racing part, well I’ve always loved Formula 1 and I’ve always loved the idea of a racing team, so it just felt right and good to create FMX Racing. You obviously have a wealth of experience when it comes to both racing at the highest level and heading up the R&D for several other brands - why did you decide now to setup your own brand? What will FMX Racing bring to the market? Will you just be producing Slalom/Foil boards or will you also be developing a line for Freeride, Wave, Freestyle? You have chosen to pair up with Maciek Rutkowski (FMX Racing / Challenger Sails), who you worked with at I-99, why did you want to bring Maciek on to your team? 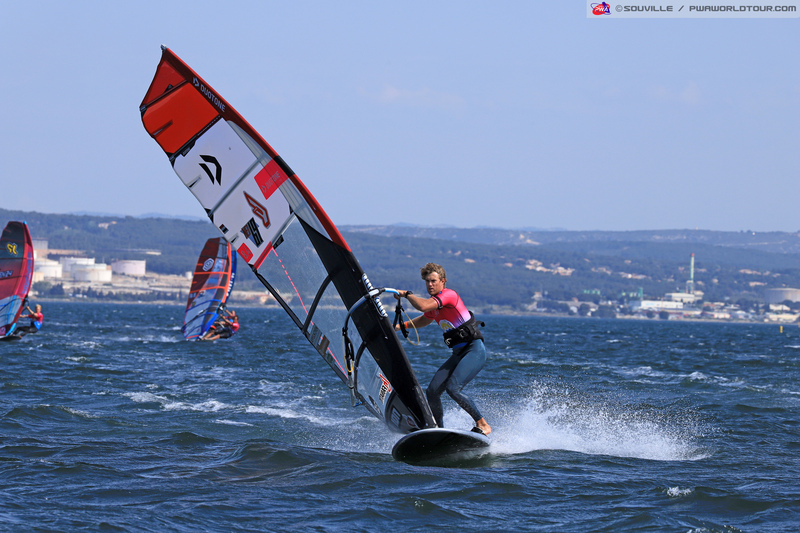 FM: “Maciek has proven over the last few years that he has the top level talent in both Slalom and Foil. I find him intelligent to work with and he provides in-depth and useful feedback. I think he has a great work ethic and you can tell that he really wants that break out season, so it felt like a logical step. What are the aspirations for FMX Racing over the coming years? Where and when will FMX Racing boards be available for the public to buy? Where are you producing your boards? Personally for you what is your plan in terms of racing this year? And do you have a goal for the coming season? Anything else you’d like to add about FMX Racing? Thanks, Finian. Good luck for the rest of this week and for the future with your new venture. 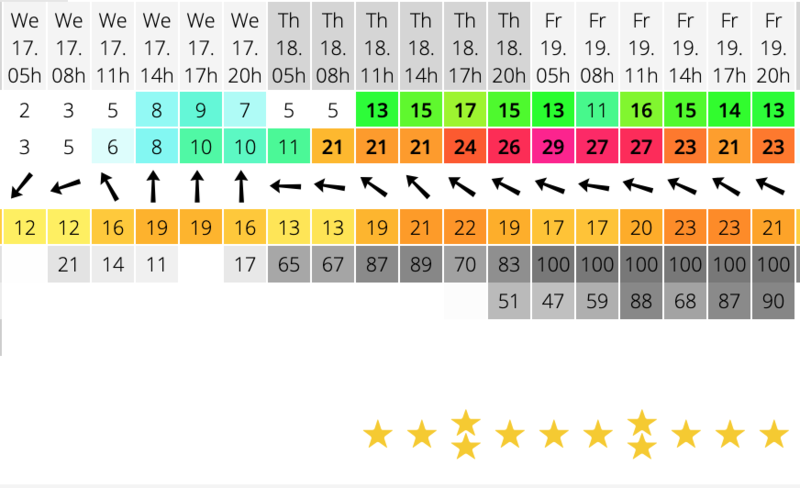 The forecast for tomorrow brings plenty of promise with 18-25 knot southeasterly winds currently predicted for the second day of the Marignane PWA World Cup. The sailors will meet again tomorrow morning at 10am for the skippers’ meeting with racing commencing from 11am (GMT+2) onwards. To stay up to date with all the latest developments from France — including the live stream, elimination ladders, entry list, images, and live ticker simply click HERE and scroll to the bottom of the page. Ich habe das nicht immer selbst in der Hand. Die PWA z.B. sendet mir täglich am Abend des Events diese Berichte und die sind so vorbereitet. Andere machen das nicht so (oder schicken mir meist gleich gar nichts). Teilweise sind die Bilder verlinkt (wie hier bei der PWA) und damit letztlich auch nicht dauerhaft erhalten, oder es muss die jemand manuell hochladen. Ich hatte aber aus Sicherheitsgründen wegen der zunehmenden Größe des Forums keine Alternative. und Totti, wie leicht ist es denn nun ? ?welche Finne ist dabei ? Exakt 7.64kg. Also auch genau das, was aktuelle Waveboards in dieser Größenordnung wiegen. Die Boards waren warscheinlich 50% schwerer und bei den Segeln sah es nicht anders aus. Und trotzdem würden die jungs uns um die Ohren fahren ! 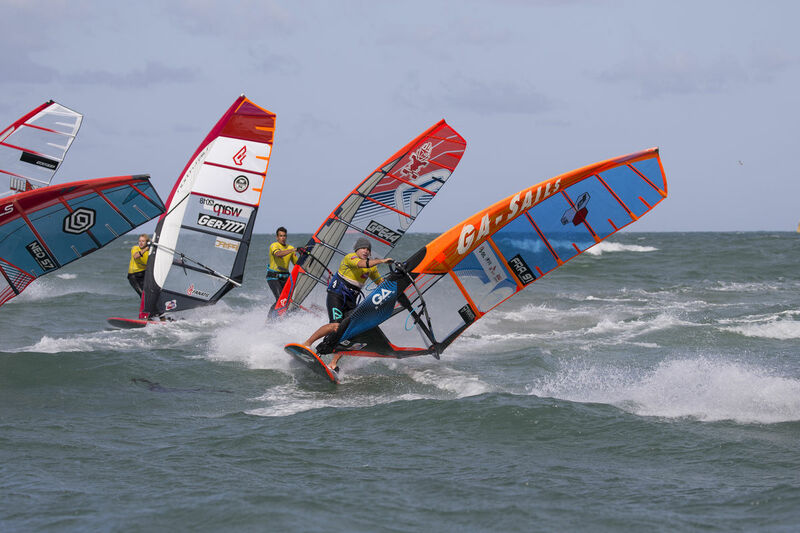 With a new addition to the calendar for 2019 the PWA Slalom World Tour will return to the French Mediterranean for the first time in just over two decades between 17th-22nd April for the Marignane PWA World Cup, which will see the world’s fastest sailors battling it out for those crucial early season points. Marignane itself is located in between Marseille - the second largest city in France - and Aix-en-Provence, a place well-known for its colourful markets and delicious French delicacies. 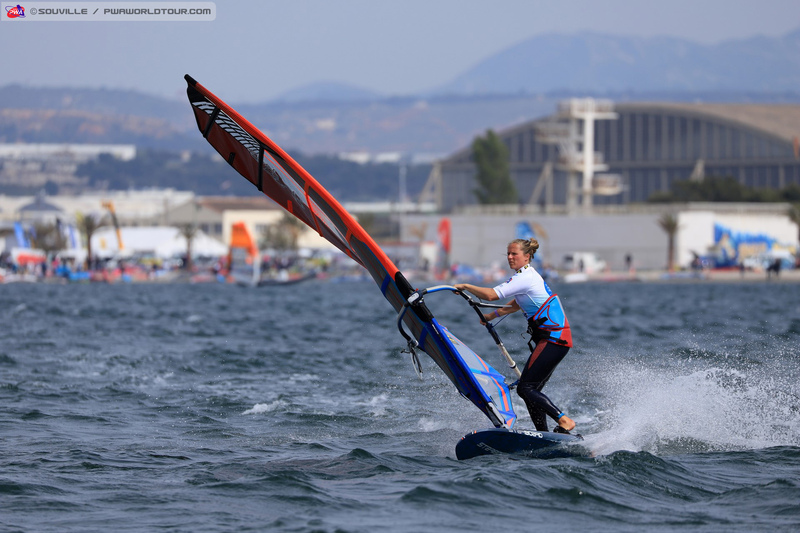 The region is renowned not only in the windsurfing world, but also the sailing world with Marseille hosting the 2024 Olympic Games nautical disciplines. Marignane is a windy wonderland and at this time of the year there can be a huge variety of conditions from 9.0m all the way down to 5.5m nuclear winds combined with chop to test even the bests mettle, so the men and women are going to have to be ready for whatever Marignane decides to throw at them! 3-time world champion - Delphine Cousin Questel (Starboard / S2Maui) - will start the season as the clear favourite for the opening event of the 2019 season. During 2018 the 27-year-old completed a clean sweep of event victories - winning in Japan, South Korea & Portugal - to claim a thoroughly deserved 3rd world title. Cousin Questel has now won the last 4 world tour events and you wouldn’t bet against her extending that winning run. 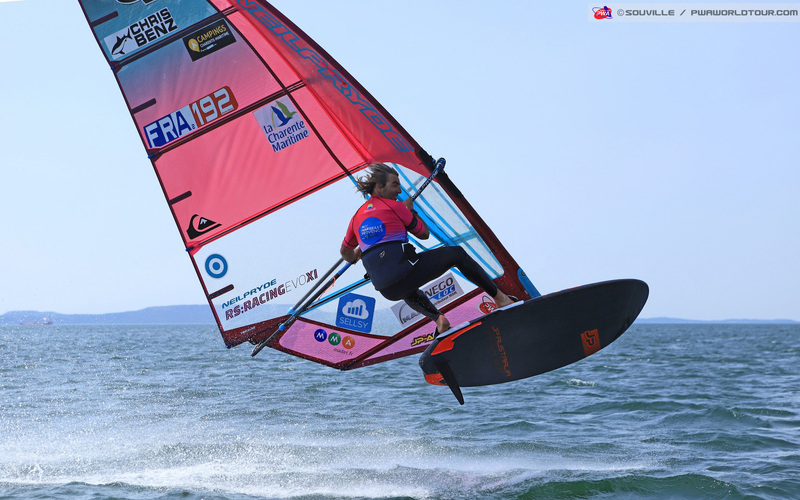 The reigning world champion is familiar with the conditions in Marignane and openly admits that she loves it when its extremely windy, choppy and technical, and those are exactly the kind of conditions we could well see in Marignane. Having suffered a lisfranc fracture last summer, and then experiencing a few setbacks with her recovery, it looked as though the opening event of the year would come a little too soon for vice-world champion - Lena Erdil (Starboard / Point-7 / AL360 / Chopper Fins), however, the Turk is set to dig deep and fast forward her return to appear in France. How hard she’ll be able to push and whether she’ll be a genuine contender for the podium, as the 30-year-old usually is, remains to be seen. The next contender will be - Marion Mortefon (Fanatic / Duotone) - who has finished 3rd overall for the last two seasons and will be hoping to make home advantage count. 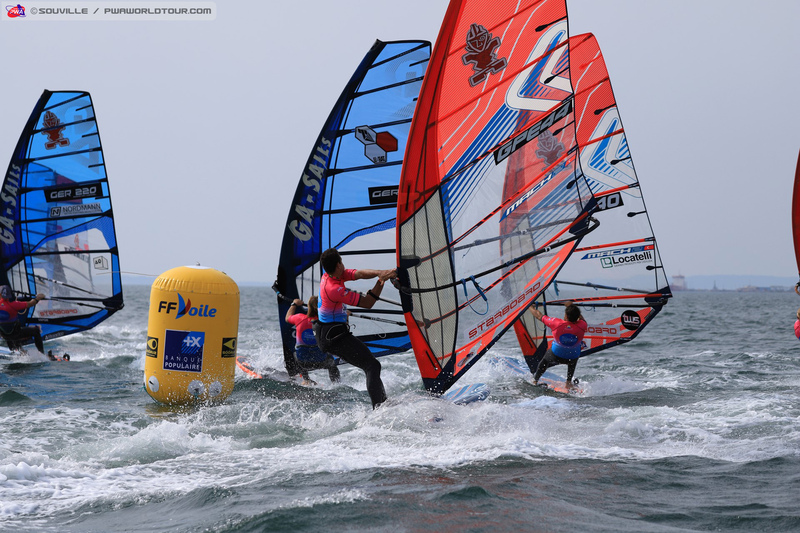 Also in contention will be 2017 Youth World Champion - Maëlle Guilbaud (Patrik / Loftsails) - who finished 4th overall in 2018 and Esther de Geus - 5th overall in 2018. 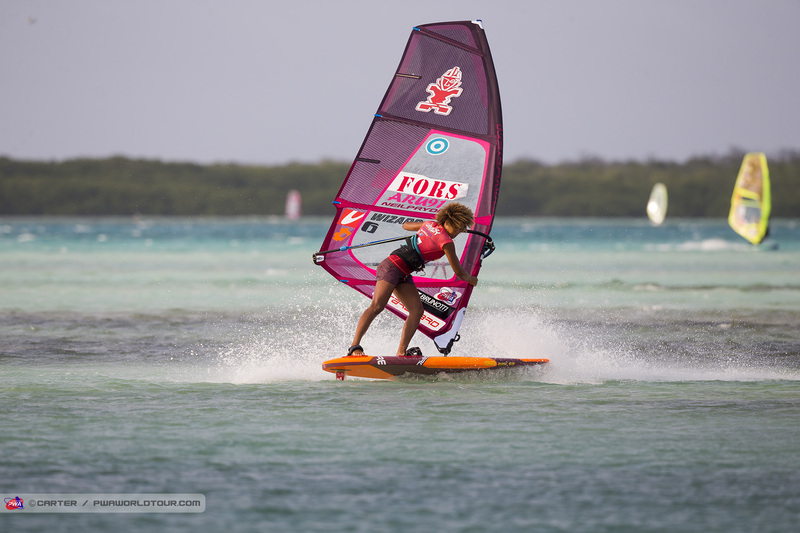 The young and talented - Lilou Granier (Starboard / Severne) - should also be a threat. The 18-year-old finished 13th overall last year, but missed one event in the middle of the season due to her studies which heavily affected her overall ranking . Granier recorded a 4th in Japan followed by a 6th in Portugal and with another winter of training under her belt she could be even more of a threat. 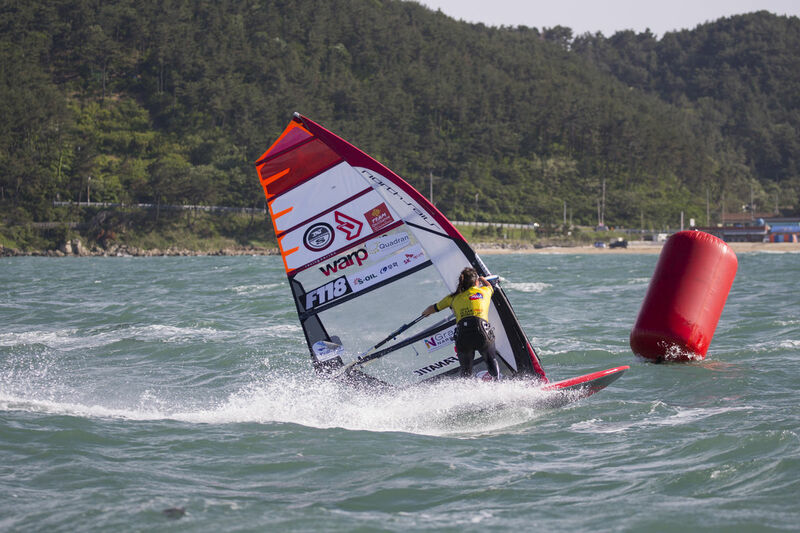 Elsewhere, keep an eye out for the likes of Jenna Gibson (Fanatic / Duotone), who won one elimination in South Korea last season and finished 6th overall in 2018 and former Youth World Champion - Fulya Ünlü (Starboard / Point-7), who has plenty of potential to challenge for the podium if everything clicks into place. So, since 2015 Albeau, Iachino & Mortefon have won 20 out of the last 23 world tour events or 86.9% between them, which makes them extremely difficult to oppose. However, there will be plenty of rivals waiting in the wings to take their shot at the top 3 and hopefully the top spot on the podium at the opening event of the year as well. Jordy Vonk (Fanatic / Duotone) will be hoping to continue the progress he made in 2018, which saw the flying Dutchman not only break into the overall top 10 for the first time, but also the top 4. Vonk has just the one podium finish to date - Japan 2017 - but with another winter of training under his belt he could be even better equipped to attack the top 3. In the past 4 years - Julien Quentel (Patrik / Gun Sails) - is one of just 3 other sailors aside from Albeau, Iachino & Mortefon to have won an event on the world tour - Japan 2017 - and the 32-year-old undoubtedly has the talent to challenge for top honours. Quentel finished 5th overall in 2018 - tied on points with Vonk - and if his starting is a little bit sharper at the business end of eliminations he could well be a genuine threat for the title. 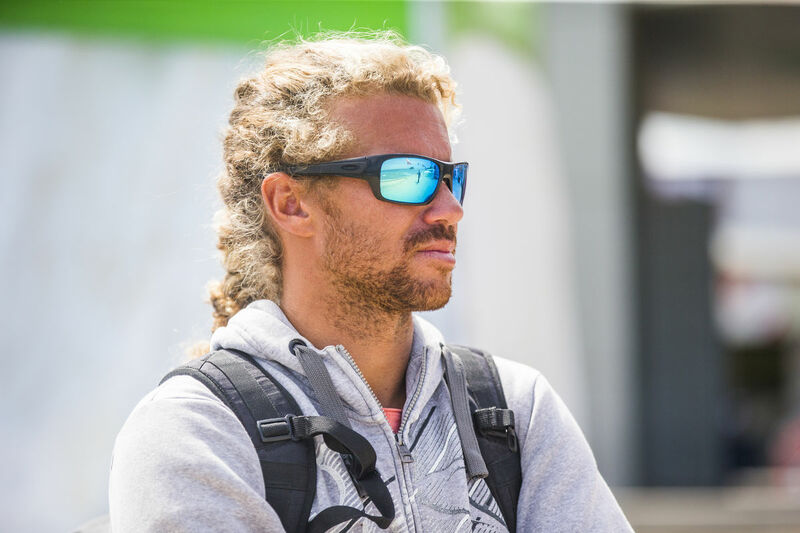 Ross Williams (Tabou / GA Sails / Shamal Sunglasses) has been in and around the top 3 for the last 3 or 4 seasons - securing numerous podiums during that time. Last year the Brit may have failed to earn a podium and endured a tough middle of the season, but towards the end of the season the Brit looked as though he was back in tune with his gear and made a strong finish to the season with a 5th and 4th in Fuerte and Sylt. If Williams can pick up where he left off then he certainly has the skillset to throw together a challenger for the title. 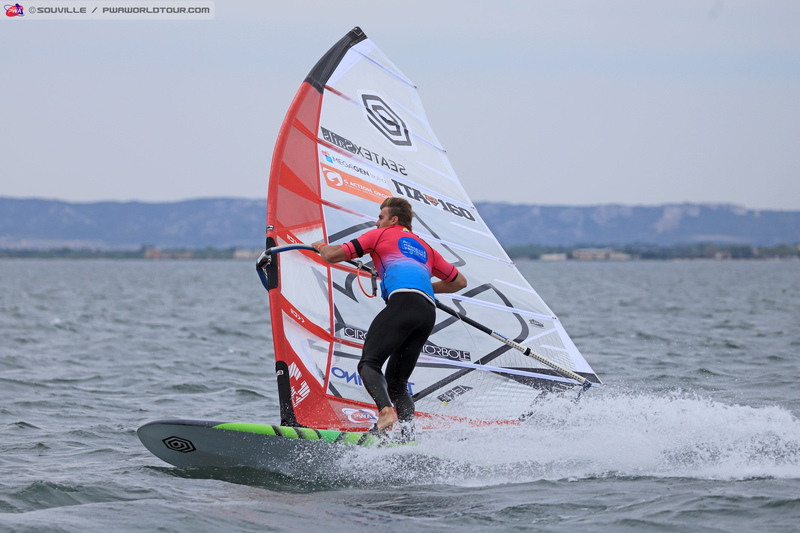 Pascal Toselli (JP / Loftsails / Chopper Fins) was in the hunt for the title during the early part of last season - particularly after a 2nd place in Costa Brava - however, the Frenchman saw his challenge slip away in the final two events and eventually finished 7th overall. If Toselli can recapture the form that he showed in the early part of last season - and sustain it - he too is someone who could feature. 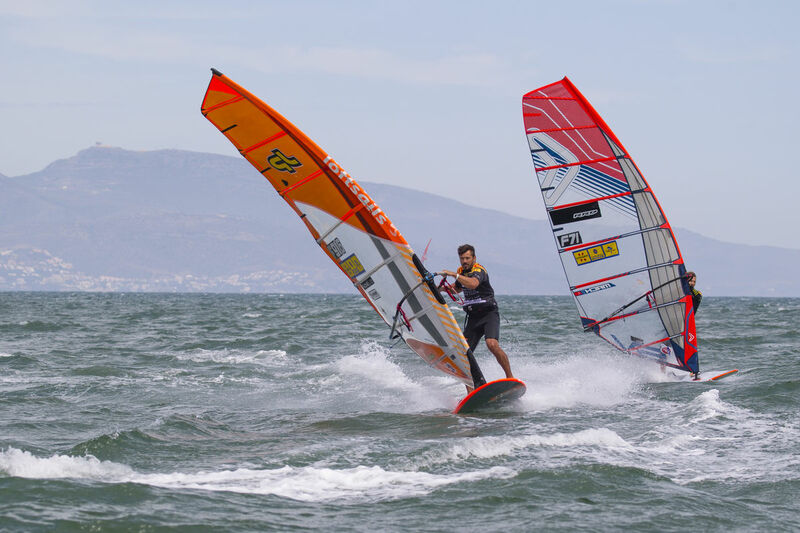 2014 vice-world champion - Cyril Moussilmani (RRD / RRD Sails) - returned to the overall top 10 for the first time since 2015 last year - securing 8th place. The Frenchman is now a fully fledged RRD sailor having left Severne Sails after several seasons together and if he can pick up where he left off at the end of last year - 4th in Sylt - Moussilmani could potentially be in the hunt for the title again after a few quiet years. 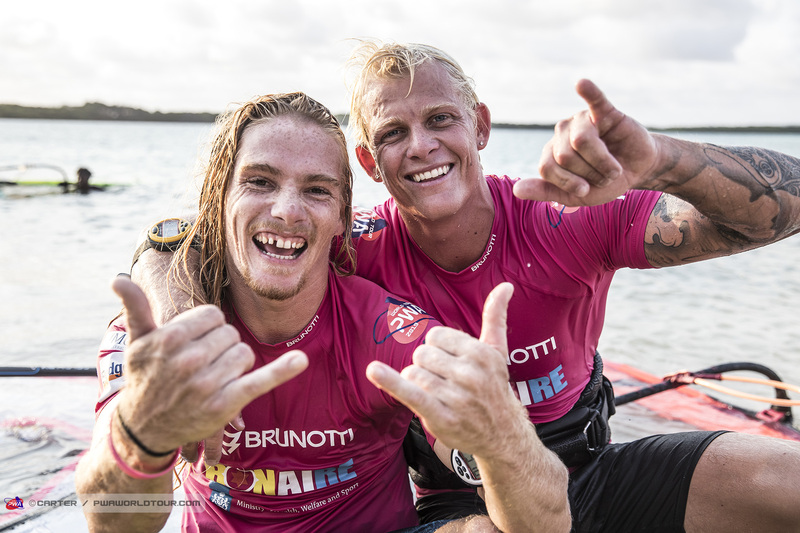 Mateus Isaac (JP / NeilPryde) and Tristan Algret (Starboard / Severne / Chopper Fins) completed the overall top 10 in 2018 and will be challenging for the top 10 again, but they may both made need another season or two to challenge at the very top. Besides Julien Quentel - Marco Lang (Fanatic / Duotone) & Finian Maynard (FMX-Racing) are the two other names to have stood at the top of the podium since 2015. 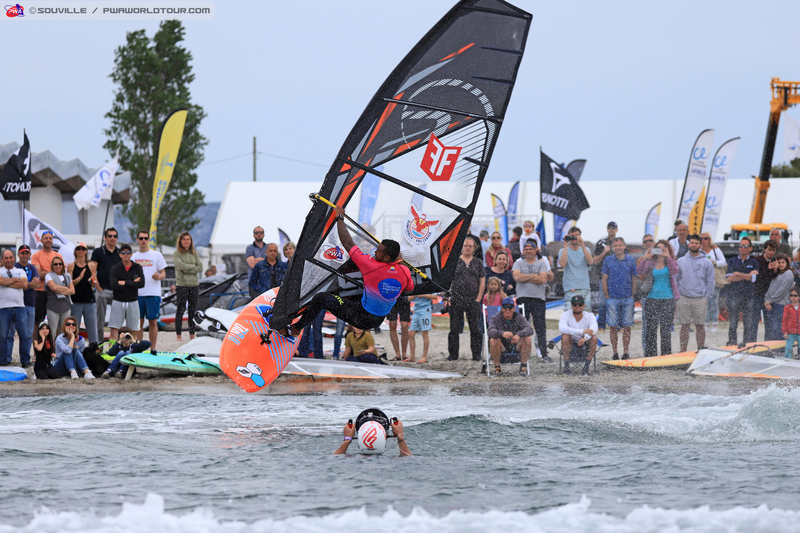 Lang won both eliminations at the 2017 Sylt PWA Super Grand Slam and finished 7th overall, but was then plagued with a mystery virus last year, which eventually forced his early retirement from the 2018 calendar in Fuerteventura. Now, after months of recovery and rehabilitation it seems Lang is ready to return. The question is can he do so with a bang? 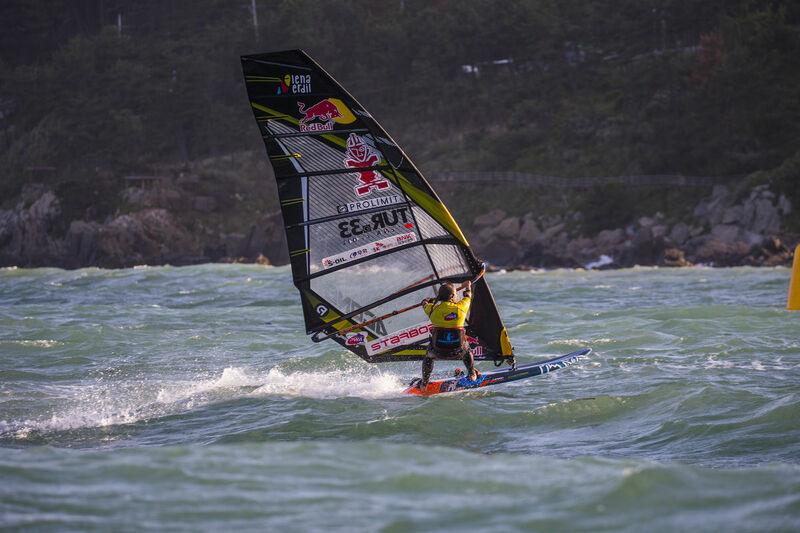 Maynard, meanwhile, won the 2018 Costa Brava PWA World Cup and was supposed retire last year, but has since started his own board brand - FMX Racing - and will be hoping that he and Maciek Rutkowski (FMX Racing / Challenger Sails) can give his new brand a bright start. 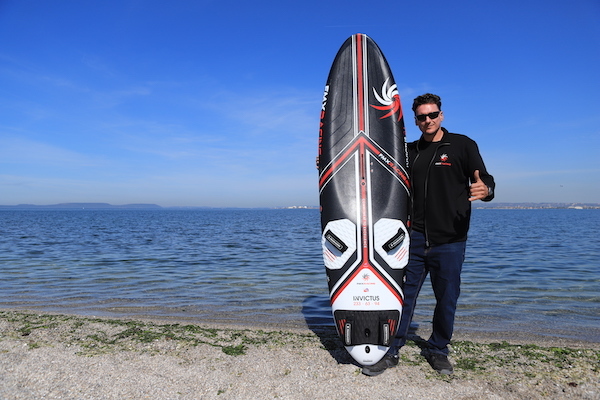 Maynard is not the only sailor to have started his own board brand over the winter with Arnon Dagan (Future Fly / NeilPryde) also starting a new venture with Future Fly. 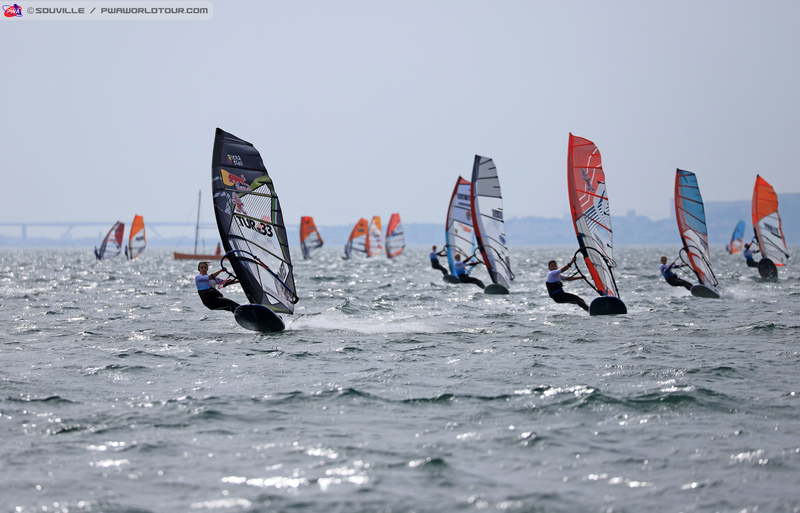 The Israeli and Taty Frans (Future Fly / Point-7) will head up the brand to start the season. Dagan will be aiming to reclaim his place in the overall top 10 having finished 16th in 2018. Meanwhile, Frans will be hoping he can recapture the form which saw him finish 6th in 2016. 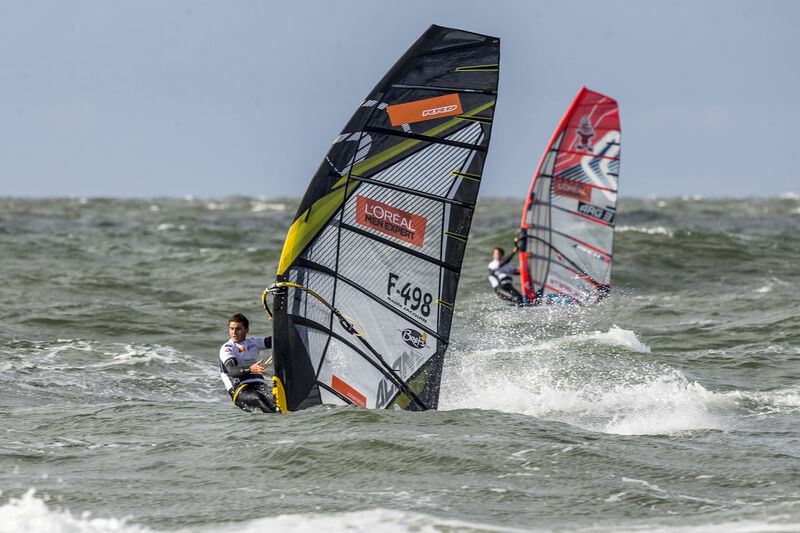 Elsewhere, keep an eye on the youthful talents of Basile Jacquin (I-99 / Point-7), who earned his first top 10 finish in Sylt last year, and Ethan Westera (Tabou / GA Sails), who continues his comeback after suffering a serious injury in 2017. There are plenty of other names who could feature in the battle for the top 10 too such as Ben van der Steen (Goya Windsurfing / Gun Sails), Cedric Bordes (Tabou / GA Sails), Antoine Questel (Starboard / S2Maui), Andrea Cucchi (Starboard / Point-7) and Vincent Langer (Fanatic/ Duotone), who finished on the podium in Sylt in 2017, to just name a few. 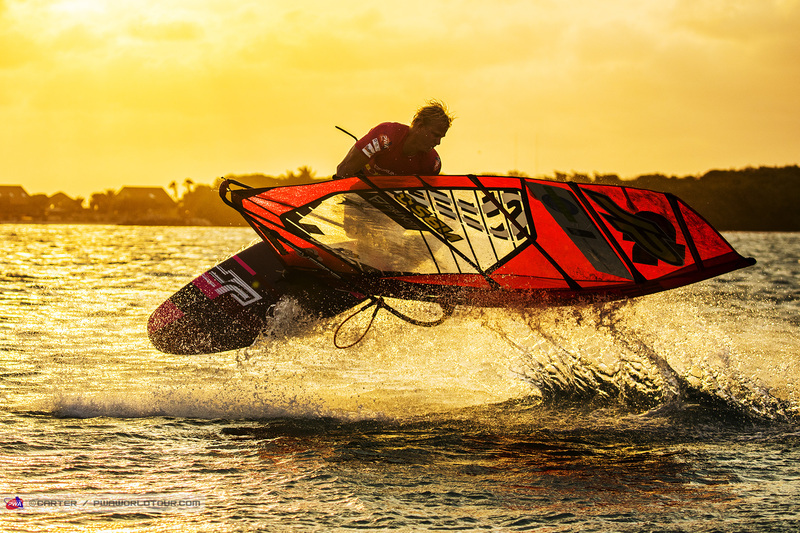 The opening day of the contest currently looks like the wind will remain light, but both Thursday and Friday both hold plenty of potential for the opening races on the 2019 calendar to be complete. 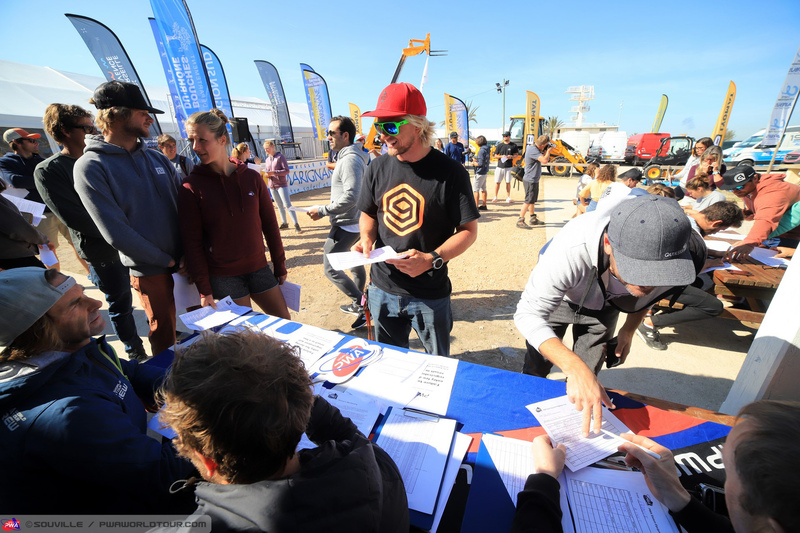 Make sure you stay tuned to www.pwaworldtour.combetween 17th-22nd April to follow everything from the Marignane PWA World Cup live. 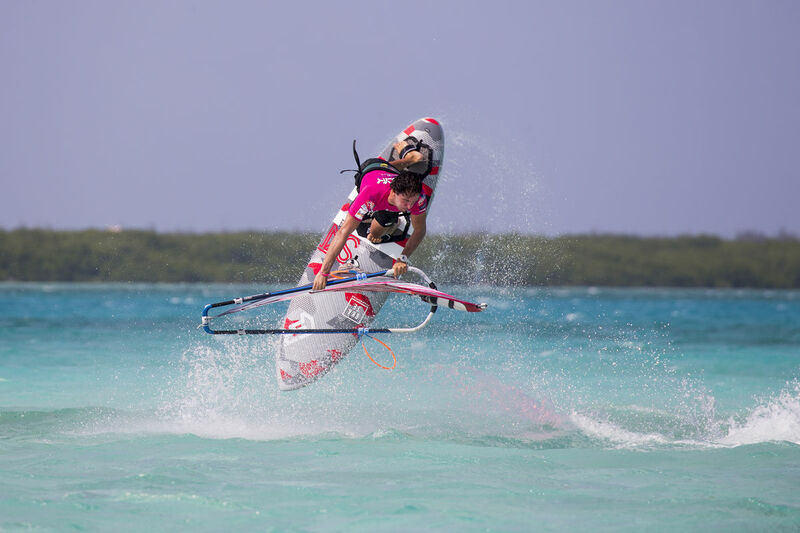 Sarah-Quita Offringa (Starboard / NeilPryde / Maui Ultra Fins) was pushed all the way by vice-world champion - Maaike Huvermann (Starboard / Severne / Maui Ultra Fins), who became the first woman in 11 years to win a heat against Offringa on the PWA Freestyle World Tour, but eventually it was still the 11-time Freestyle World Champion who would walk away from Bonaire as the event champion. Having not faced in defeat in so long, many people wondered how Offringa would cope in the Super Final, but she barely put a foot wrong as she posted the second highest scoring heat of the contest with 140.7 points. 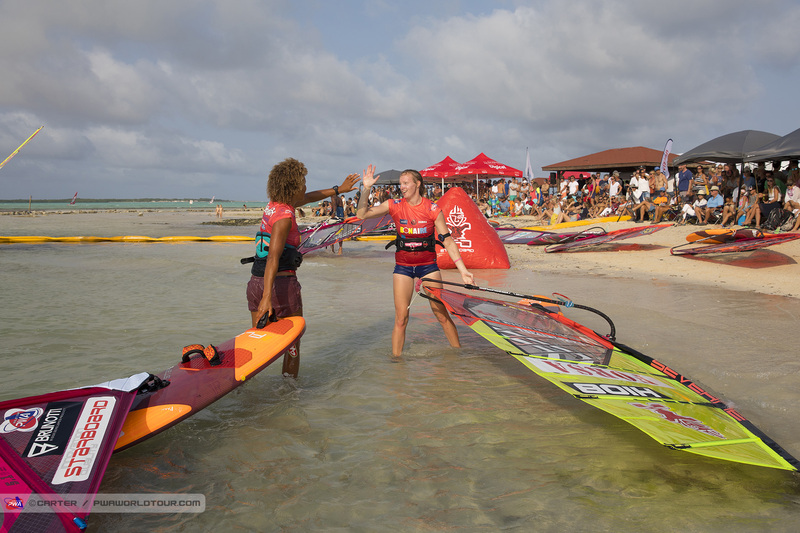 When Huvermann faced Offringa for the first time in the single elimination the 21-year-old said that she would use a different approach against the reigning world champion and that’s exactly what she did with Huvermann throwing everything she had at Offringa on each of the 3 occasions she faced her in Bonaire. Huvermann’s aggressive approach eventually paid off in the double elimination Final as she landed a regular chachoo on the buzzer to force a Super Final. In hearing the result Huvermann fell to the ground in celebration, but couldn’t quite find a way to defeat Offringa two-times in a row. However, the 21-year-old must be delighted with taking a heat off Offringa and things now become very interesting heading into Fuerteventura in July. 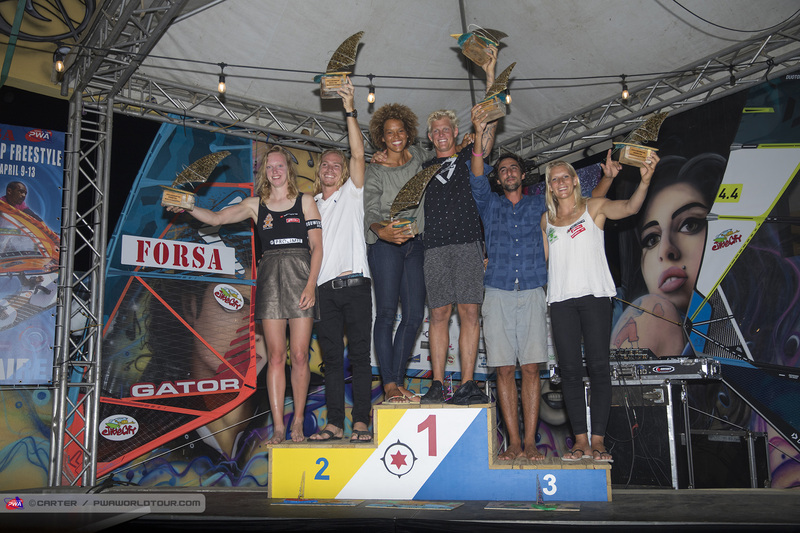 Oda Johanne (Starboard / Severne / Maui Ultra Fins) sailed consistently and stylishly throughout to claim the final place on the podium. 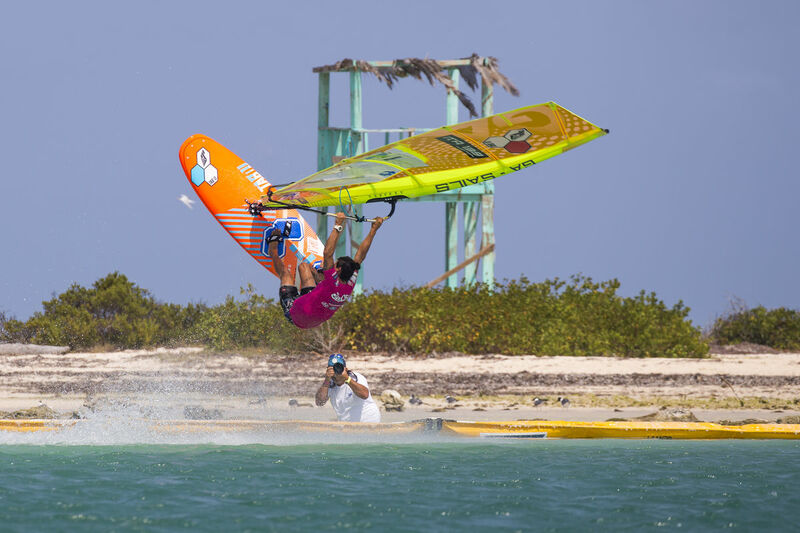 Last year’s world No.3 couldn’t find a way to threaten the top 2 this time out, but will no doubt be training hard between now and the next world cup in Fuerteventura. Arrianne Aukes (Fanatic / Duotone / Maui Ultra Fins) successfully defended her 4th place from the Single Elimination, but will probably be a little bit disappointed to have not beaten Oda Johanne (Starboard / Severne / Maui Ultra Fins) as she certainly had the opportunity with the Norwegian not enjoying her best heat. However, Aukes couldn’t quite find the higher scoring manoeuvre she needed on starboard tack and may feel that this was an opportunity missed to earn her first podium finish since 2014. 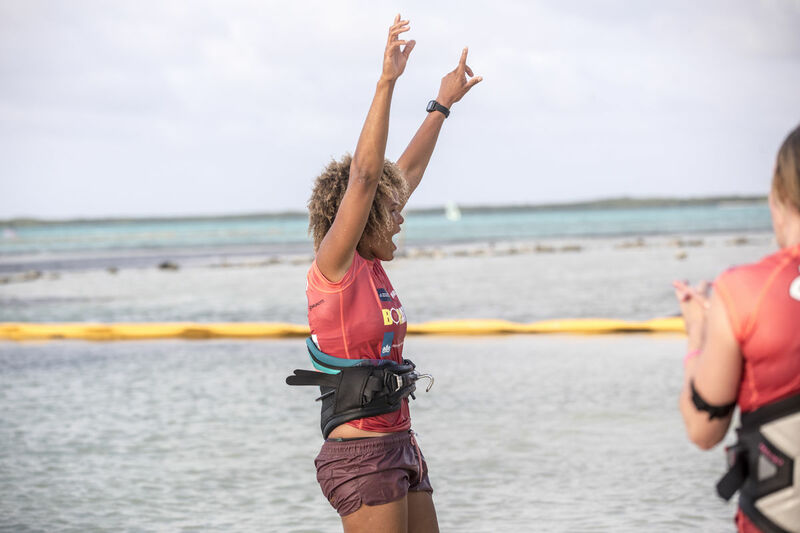 Jazzy Zwerus (JP / NeilPryde) won 3 consecutive heats in the double elimination to fight back into 5th place in her first competition since 2016. On her way to fifth, the 23-year-old defeated last year’s world No.5 - Johanne Rümenapp (I-99 / Gun Sails) - Julia Pakosz and Francesca Floris (RRD / RRD Sails). Amado Vrieswijk (JP / Severne) may have had to do things the hard way, but eventually, the 23-year-old deservedly claimed the top spot on the podium to make the perfect start in the bid for his first world title. 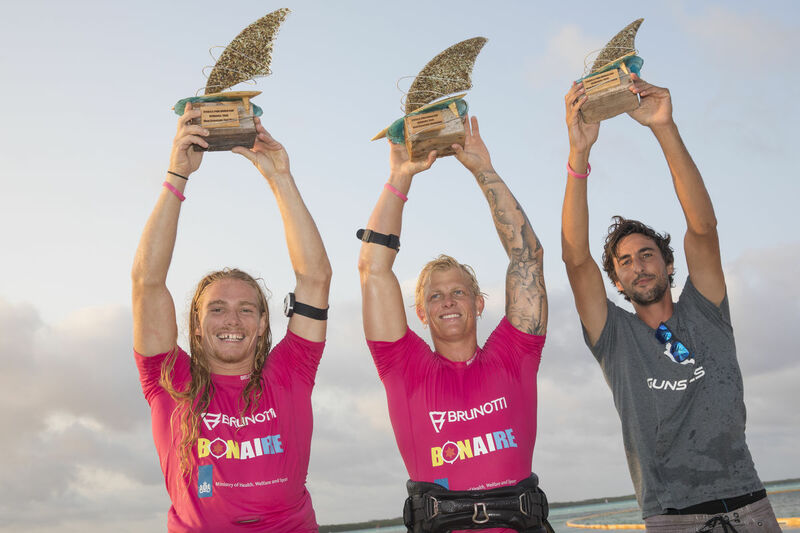 A second round exit in the single elimination meant that Vrieswijk then faced a gruelling fight back through the double elimination, but it was evidently a fight that he relished as he won 10 consecutive heats to deservedly be crowned the King of Bonaire. Vrieswijk consistently posted heats scores over 180 points - and was the only sailor to achieve this feat - so there can be no complaints that the best man won. Having defeated his major rival, 9-time Freestyle World Champion - Gollito Estredo (Fanatic / Duotone) - in just the second round of the double elimination it now seems the path by finally be opening up for Vrieswijk to get his hands on the biggest trophy of them all. Youp Schmit (I-99 / Avanti) couldn’t quite defend his single elimination crown, but put up a brave fight against Vrieswijk in the Super Final. The 24-year-old had to sail through the pain barrier and then needed to be rallied by the home crowd after breaking his fin in the first few minutes of the Super Final and almost found a way to defeat Vrieswijk, but not quite. 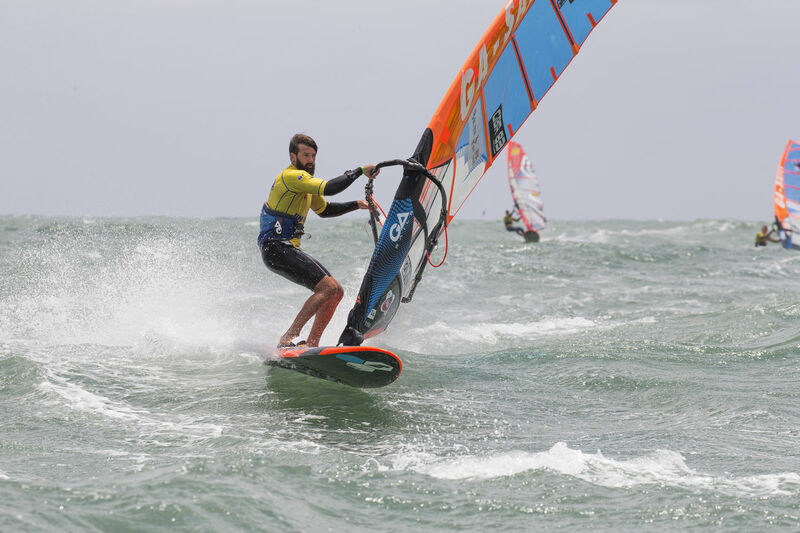 Schmit clearly revelled sailing at his home event and walks away from the opening event of the season with his first ever podium, while also emerging as a potential world title challenger for the remainder of the year! There were quite a few upsets along the way in the men’s division with the form book seemingly being thrown out of the window, but the biggest upset of them all was delivered by Julian Mas (JP / Gun Sails), who defeated Gollito Estredo in the first round of the single elimination. 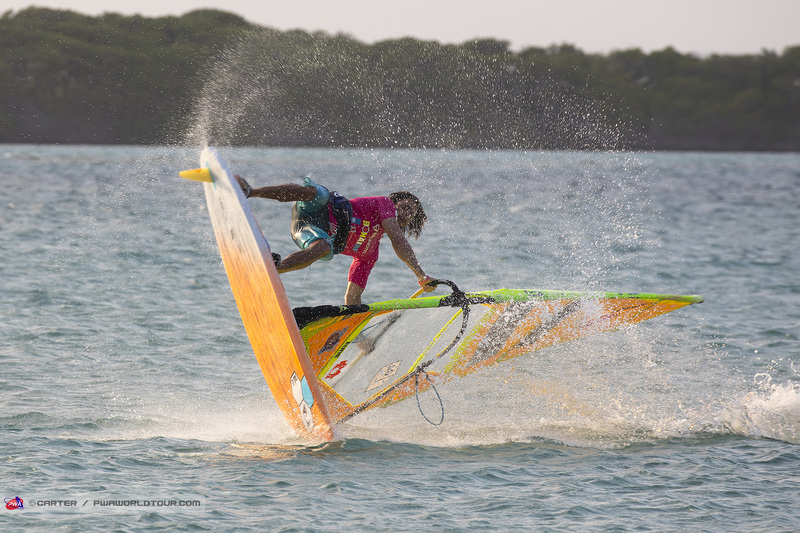 The Frenchman landed a new combination in a contest with a flaka-bob and was consistently able to land this manoeuvre along with many others to advance all the way into the final of the single elimination, which would also guarantee Mas a first ever podium! Eventually, the 29-year-old would finish 3rd and can be delighted with recording his best ever result on the PWA World Tour. 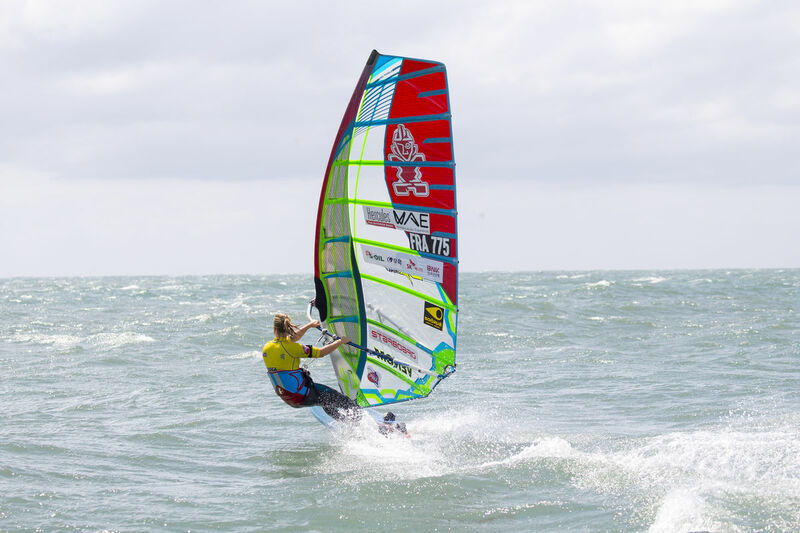 Last year’s world No.4 - Yentel Caers (I-99 / Point-7) - starts the year with a solid 4th place and with he and Vrieswijk the only members of last years overall top 5to make it into the top 4 here in Bonaire - Caers could prove to be Vrieswijk’s main challenger for the world title going forwards. Giovanni Passani (Tabou / GA Sails / AL360) will walk away from the opening event of the year a very happy man with the Italian deservedly claiming his first top 10 result on the world tour - 5th. 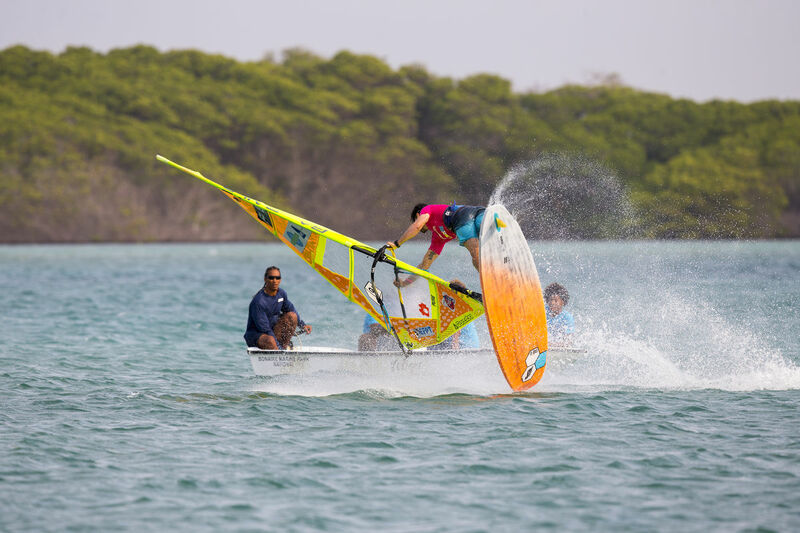 The 23-year-old sailed brilliantly throughout executing his moves clinically and with plenty of style! Antony Ruenes (Tabou / GA Sails) fought his way back from the first round in the double elimination to 6th place after gaining momentum and winning 5 heats in a row. 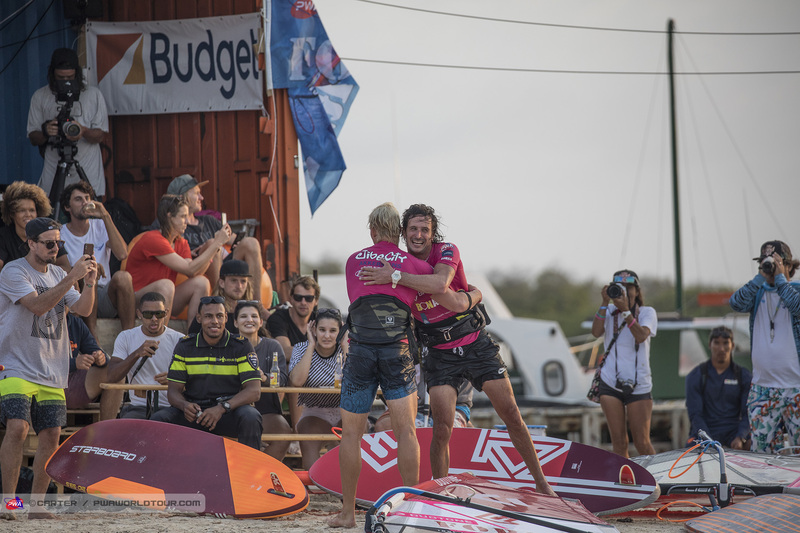 Firstly the Frenchman defeated former world champion - Kiri Thode (Severne / Severne Sails) - followed by Francesco Cappuzzo (RRD / RRD Sails / AL360), Nicolas Akgazciyan (JP / NeilPryde), Taty Frans (Point-7) and finally a hard fought win over teammate Scheffers (Tabou / GA Sails). However, Ruenes’ comeback was then brought to an end by eventual champion - Amado Vrieswijk. Like Ruenes, Scheffers also staged a brilliant comeback through the double elimination which saw the Dutchman win 4 hits on the bounce to earn joint 7th place alongside last year’s vice-world champion - Adrien Bosson (Fanatic / Duotone / Maui Ultra Fins), who was a little unfortunate to meet Amado Vrieswijk in Heat 30a as aside from the Bonairean, Bosson was the next highest scoring heat with - 176.9 points. 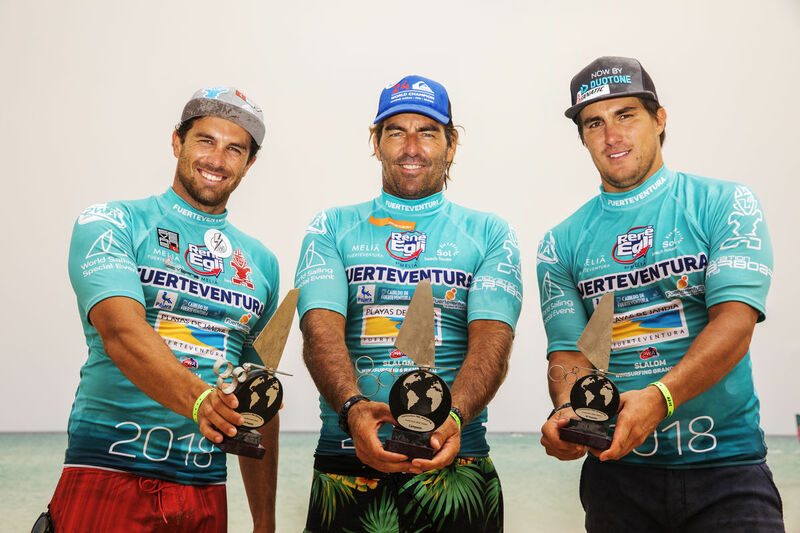 The top 10 was completed by Taty Frans (Point-7), Steven Van Broeckhoven (Starboard / Gun Sails / Shamal Sunglasses), Sam Esteve (JP / NeilPryde) & Julian Wiemar (Starboard / Severne). 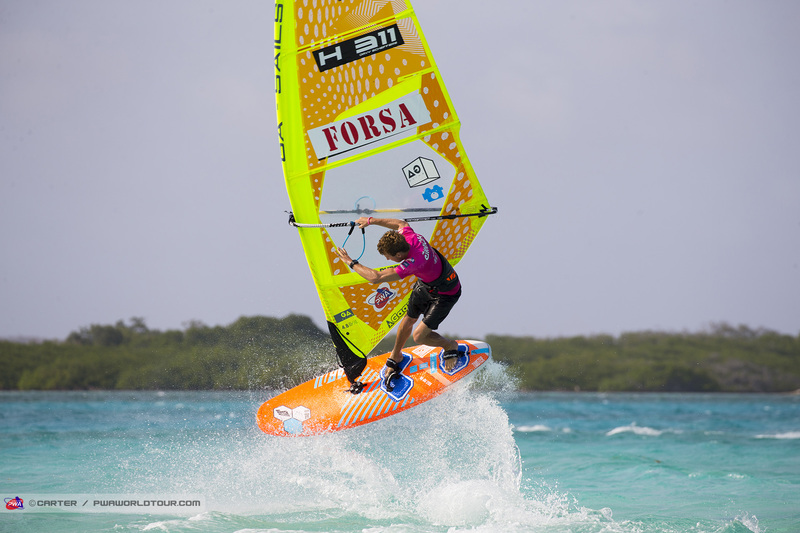 The PWA would like to extend their thanks to the organisers, sponsors and everyone that helped out at the 2019 FORSA Bonaire PWA World Cup for making it such a great start to the year - we hope to be back in 2020. Having started the season with an explosive installment of Freestyle it is now time for the Men’s and Women’s Slalom fleet to take centre stage for the first time this season. Where? 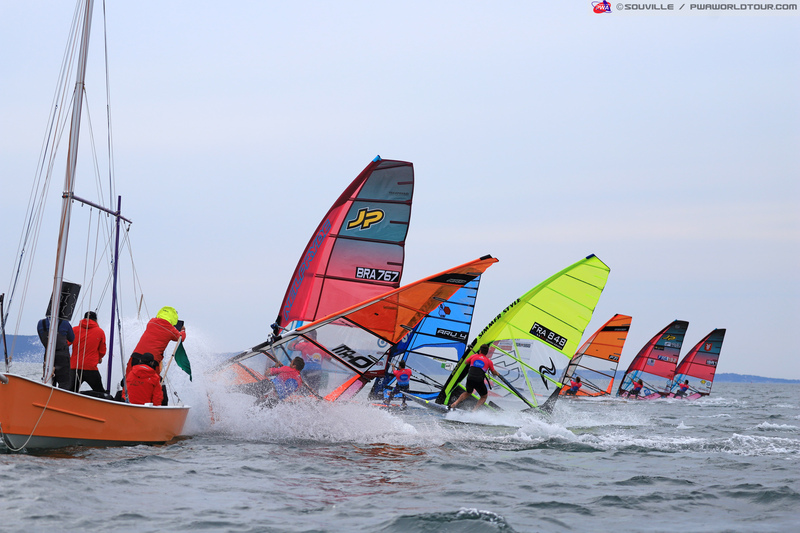 The South of France for a new addition to the calendar with the Marignane PWA World Cup running between 17th-22nd April. Die Macken haben kein Wasser gezogen, das war vom Transport nach Sylt und wir sind dann von da nach England und hatten zuviel Zeug. Ich wiege es nachher. Sehr leicht ist es nicht, es muss halt was aushalten bei der Größe. Ich meine, ich habe auch noch die passende Finne dazu mitbekommen. Schaue ich nach. Kommt man in Saintes Maries de la Mer überhaupt noch über den Parkplatz hinten raus an den Strand, wo der ehemalige Kanal ist? Irgendwann hatten die Wächter dort mal zickig reagiert. Ich habe das Problem schon früher erkannt und habe es Patrik nochmal dringend nahegelegt, dass die Boards unter 245-247cm bleiben müssen wegen der Hänger, WoMo's, WoWa's. Ich gehe davon aus, dass er nun mittelfristig (für 2020) darauf reagieren wird. Er sieht meist wenig Bedarf für Änderungen, zumal das Board wohl gerade in F Testsieger wurde. Dann möchte ich dich (und jeden anderen hier!) bitten, dass im entsprechenden Bereich kundzutun. Hier in diesem Bereich geht es um die relevante Gabel einer Marke, welche hier präsentiert wird und nur Fragen zum Artikel an sich zur Diskussion stehen. Ich denke, die Beschreibung des Bereichs ist völlig klar. 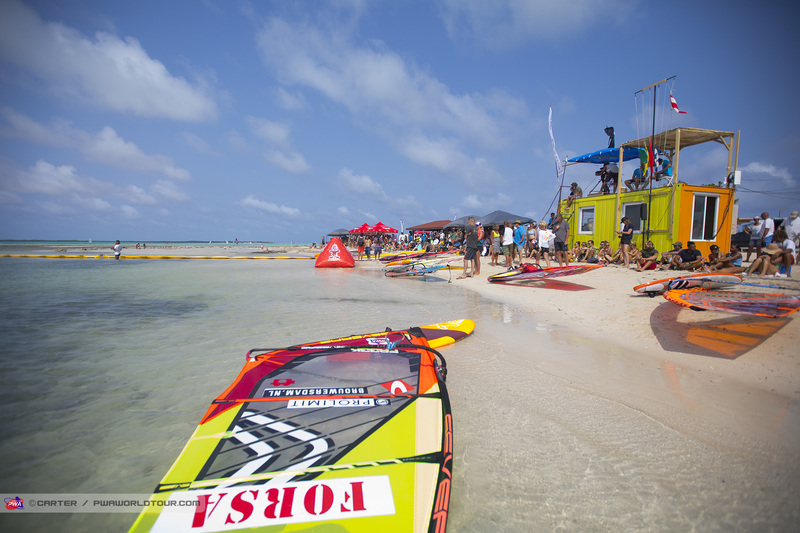 The final day of the 2019 FORSA Bonaire PWA World Cup was billed as Super Saturday and in the end it didn’t disappoint with a mix of emotion and drama making for a fitting finale in front of a packed out crowd, who created a football match-esque atmosphere which spurred the world’s best freestylers to push even harder in the pursuit of victory. Finals day was split into two halves and in the morning the women’s fleet was whittled down to just the top 3 ladies standing, which saw Arrianne Aukes (Fanatic / Duotone / Maui Ultra Fins) successfully defend her 4th place, but she may feel there was a missed opportunity as she pushed Oda Johanne (Starboard / Severne / Maui Ultra Fins) all the way in the battle for 3rd and 4th, but couldn’t quite land the higher scoring move she needed on starboard tack to earn her first podium since 2014. 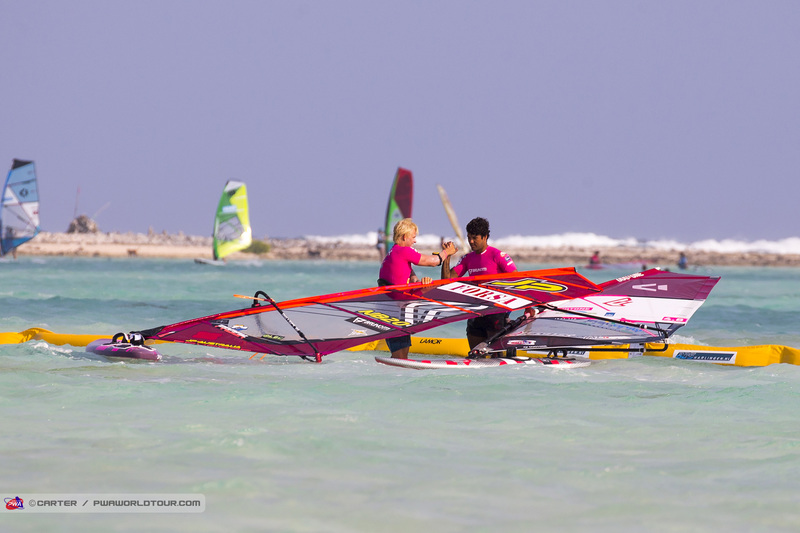 Upon the restart Johanne faced a rematch with Maaike Huvermann (Starboard / Severne / Maui Ultra Fins) and for a long time the heat was evenly balanced, however, Huvermann then upped her game by landing a double spock on both tacks and a culo to setup a rematch with Sarah-Quita Offringa (Starboard / NeilPryde / Maui Ultra Fins) - leaving the Norwegian to complete the podium in 3rd place. Into the final and Huvermann, just as she did in the single elimination, threw everything she had at Offringa, but for a long time, it was the Aruban leading the fight and looking like she would claim the victory there and then. However, Huvermann managed to stay in contention throughout and in the dying seconds the 21-year-old performed a buzzer beater as she landed a superb regular chachoo to take the event into a Super Final. 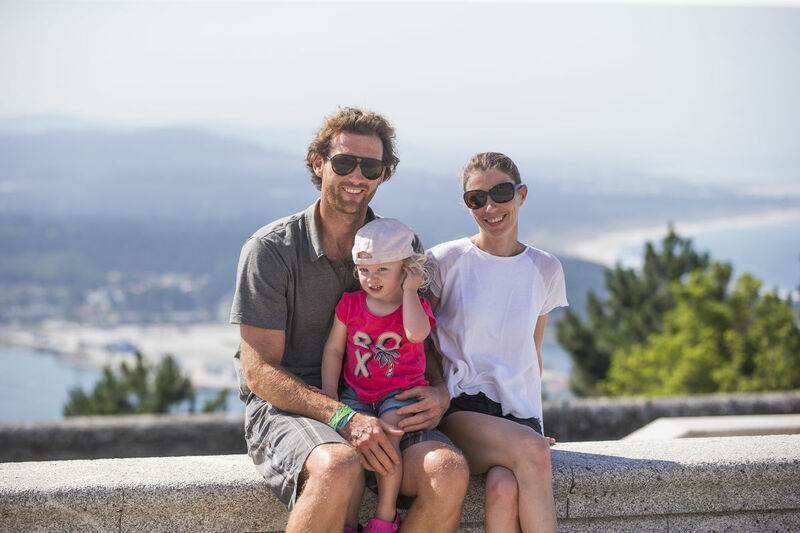 Offringa was as gracious in defeat, her first time that she had lost a heat in 11 years on the world tour, as she is in victory, but unsurprisingly she was emotional upon hearing the result. Meanwhile, with a rapturous crowd and becoming the first person to take a heat off Offringa, Huvermann dropped to the ground almost in disbelief as emotions rose to the boil. After a short break , Offringa and Huvermann would once again go head-to-head in a winner takes it all finale, which turned into another enthralling battle. However, it was Offringa who was able to raise her game to another level as she dug deep to win the opening event of the year. 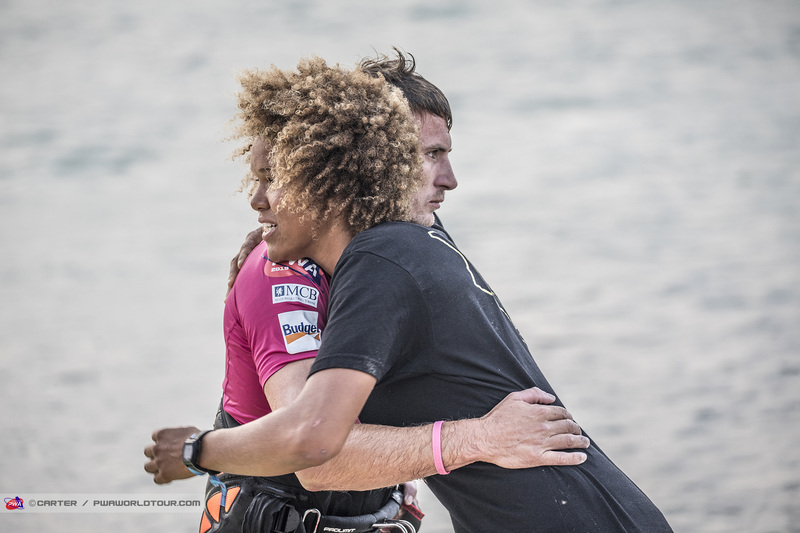 Huvermann, after reaching the dizzy heights of the final couldn’t quite replicate the same performance again and after a couple of failed double spock attempts it took some words of wisdom from the beach by Dieter van der Eyken (Severne / Severne Sails) to lift Huvermann to fight further. And that’s exactly what she did - landing double spocks on both tacks again almost immediately afterwards. Offringa though wasn’t to beat as she set the second highest scoring heat of the contest to rightfully be crowned the Queen of Bonaire. Both girls deservedly received a warm reception upon returning to the beach after putting on a wonderful display. Amado Vrieswijk (JP / Severne) was the star of the double elimination and the local boy continued his comeback in the morning by defeating Antony Ruenes (Tabou / GA Sails), Giovanni Passani (Tabou / GA Sails / AL360) and Yentel Caers (I-99 / Point-7) to move into the top 3. By this point, Vrieswijk had already won 7 heats in a row. After a middle of the day interlude, Vrieswijk would then resume against Julian Mas (JP / Gun Sails), who was already guaranteed his first ever podium. The atmosphere during this heat was exceptional with the local crowd cheering for their local boy, while the French possie responded for their man. Unfortunately for Mas, he never quite scaled the heights that he had shown in the single elimination leaving Vrieswijk to march on and set up a final against fellow Bonairean - Youp Schmit (I-99 / Avanti). 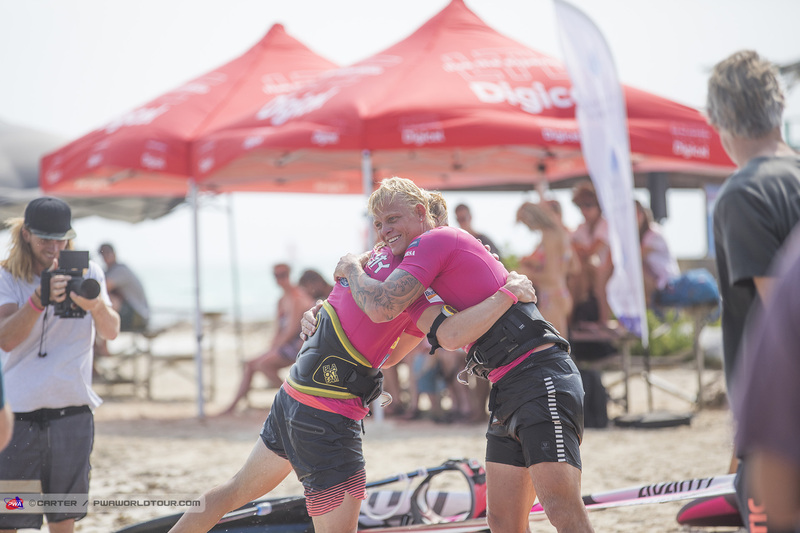 In the final Vrieswijk would prove too strong for Schmit with the 23-year-old once again posting a monstrous score over 180 points and it was soon clear that a Super Final for the Men’s fleet was also on the cards. 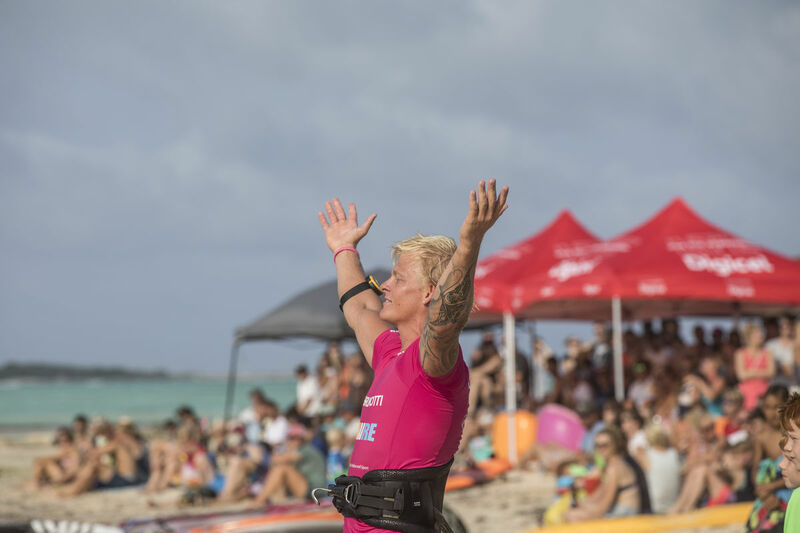 The Super Final began in dramatic fashion… prior to the heat starting, Schmit needed medical attention for a swollen foot and just a few minutes later the 24-year-old appeared to be sailing back to the beach. At this point, the crowd and the judges weren’t sure if Schmit would be forced to retire through injury. It then became apparent that Schmit had lost his fin after attempting a flaka-shaka in the shallows. Once Schmit neared the beach he threw his board away in disbelief at the timing and understandably looked dejected. However the local crowd were quick to rally behind another of their local men, almost like the 12th man, and Schmit reacted immediately by landing a double culo. The two Bonairean’s then traded world class manoeuvres, which saw the lead swing back and forth with the duel poised on a knife-edge. Ultimately though it was Vrieswijk, who would manage to complete a mammoth comeback with Vrieswijk winning 10 consecutive heats to be crowned the King of Bonaire, but even more importantly taking a massive step towards a maiden world title having earlier defeated 9-time world champion - Gollito Estredo (Fanatic / Duotone) - in the 3rd round of the double elimination. Schmit also deserves great credit for the way in which he dug deep when it really counted and should be hugely proud on his first podium finish on the world tour, which also sees him end the event as one of the title contenders for 2019. Shortly after the conclusion of the finals, a prize giving was held in front of packed out beach and this event will go down as one of the best ever Freestyle events. We’ll be back on Monday with a full summary of a spectacular event to see how the season weighs up from here. Wer ist den Kutte, von den beiden? 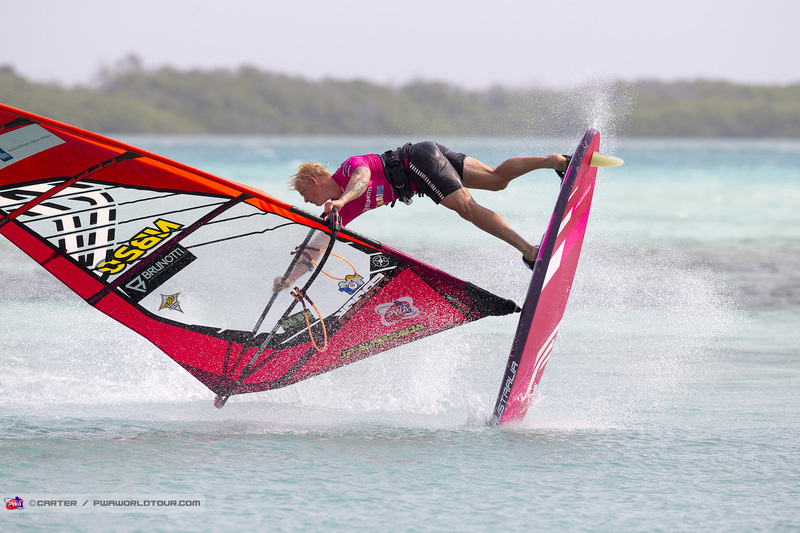 The heat between Ruenes and Scheffers turned into another fascinating battle with Scheffers once again making a flying start with a huge air bob culo, skopu 360, air funnel 720 and an amazing switch chachoo burner. However, after a flying start the 27-year-old, who was suffering slightly from a toe injury began to slow down. Meanwhile, Ruenes, who was a little slow to start began to come right back into it with a perfect spock-culo, flaka into ponch, air funnel-burner and a trademark no-handed burner taking the Frenchman into a narrow lead. Scheffers had the beating of Ruenes on starboard tack but crucially had to count a wet kabikuchi on starboard - only 11.6 points - which proved to be the difference between the two. Scheffers obviously knew that he was missing a move on starboard tack, but unfortunately just ran out of steam at the crucial moment as he crashed his final 3 attempts. Take nothing away from Ruenes though, who gathered momentum throughout the afternoon and sailed to the level everyone knows he is capable of. The Frenchman will now face Vrieswijk in the battle for 5th/6th place and beyond. 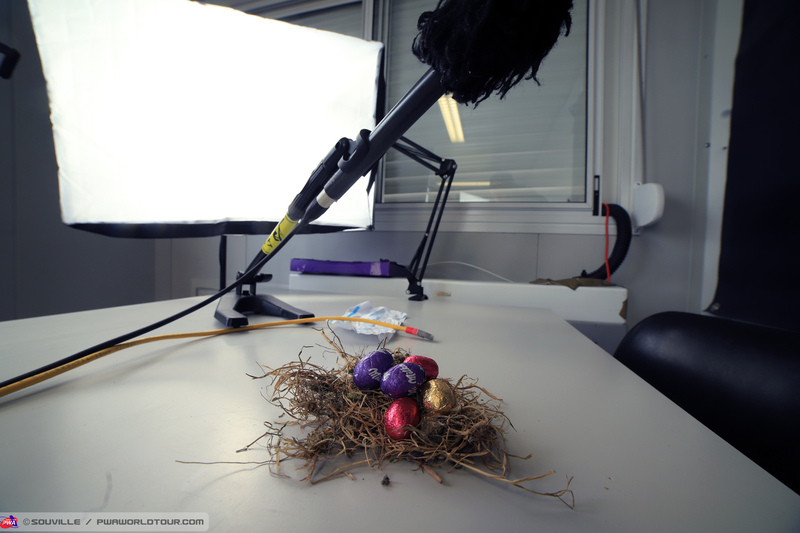 Vom 3. bis 10. 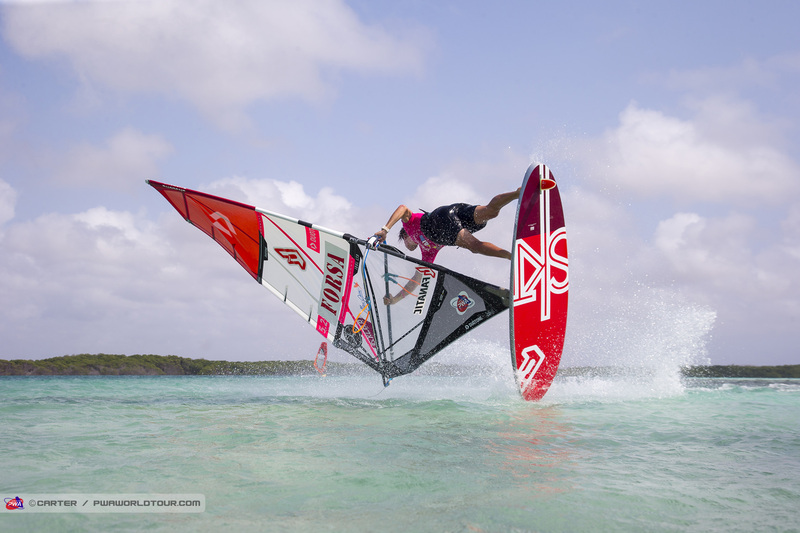 Juni 2019 starten die besten deutschen Windsurfer mit dem Multivan Summer Opening in die Saison 2019. Der Tourauftakt wird am Brandenburger Strand in Westerland auf Sylt ausgetragen. 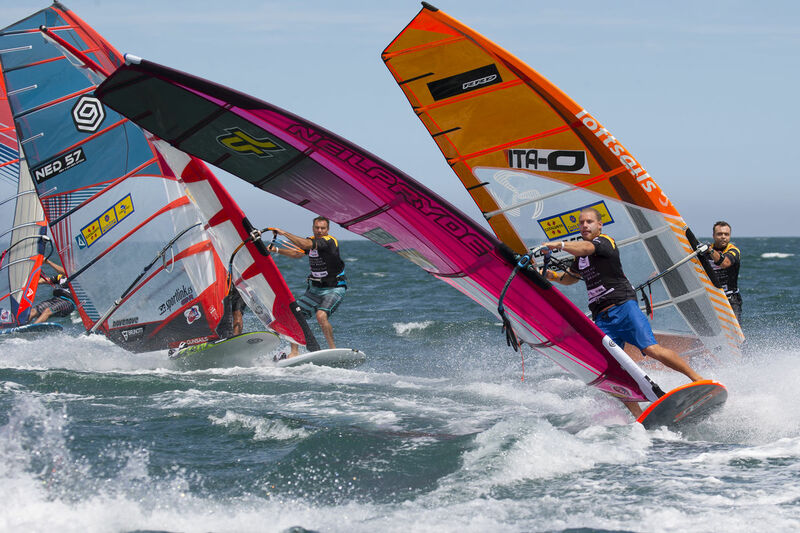 Beim Multivan Summer Opening steht neben den professionellen Wettkämpfen der Windsurfer eine bunte Mischung aus sportlichen Aktivitäten und Freizeitspaß zum Mitmachen für die ganze Familie im Mittelpunkt. Für kulinarischen Genuss, eine vielfältige Shoppingmeile und verschiedene DJs mit abendlicher Chill-out Stimmung ist gesorgt. In diesem Jahr bilden die IFCA Slalom Weltmeisterschaften das sportliche Highlight der Veranstaltung. 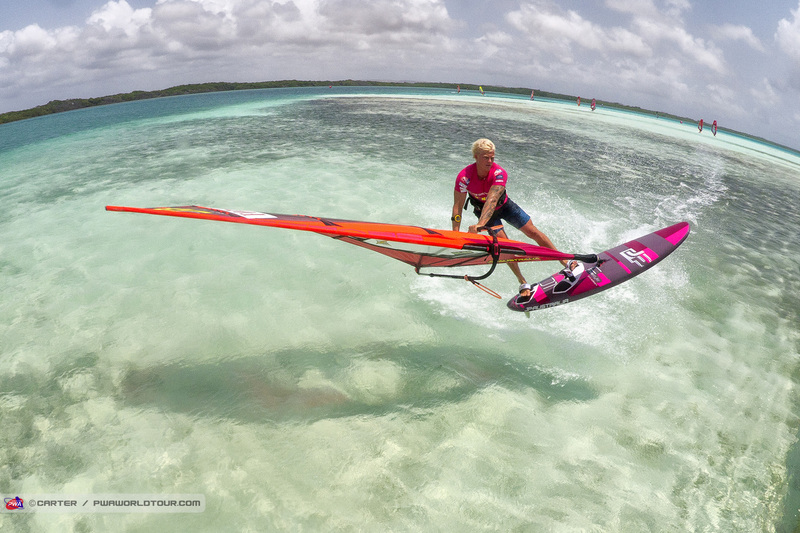 Hierfür werden die besten Windsurfer aus aller Welt zu Gast sein und um den Weltmeistertitel kämpfen. Die Regatta ist mit einem Preisgeld von 10.000 Euro dotiert. „Wir sind stolz, dass die IFCA uns nach der erfolgreichen Zusammenarbeit zu den Europameisterschaften im letzten Jahr die Durchführung der IFCA Slalom Weltmeisterschaften anvertraut. Wir sind uns sicher, dass das internationale Fahreraufgebot die Attraktivität des Events für die Besucher nochmals steigern wird“, so Matthias Regber (CEO der durchführenden Agentur Choppy Water GmbH). Im letzten Jahr haben ca. 130.000 Besucher die Slalom-Elite bestaunt und auch in diesem Jahr kann man sich auf eine beeindruckende Show auf dem Wasser freuen. Auch die Racer und Waverider werden beim Multivan Summer Opening nicht zu kurz kommen. Mit den zusätzlichen Disziplinen Racing und Wave ist für Action bei allen Bedingungen gesorgt. 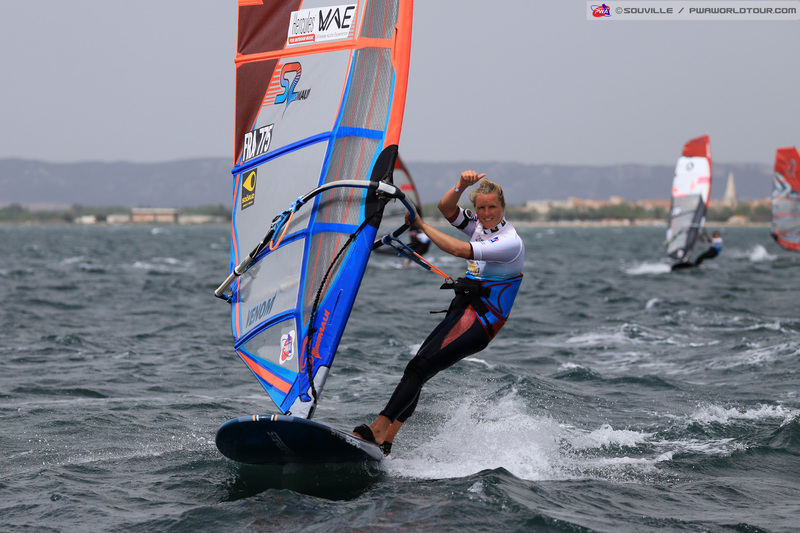 Ihre Ergebnisse werden als Teil der nationalen Rangliste des Multivan Windsurf Cups gewertet. Neben dem Multivan Windsurf Cup stellen die Multivan Kitesurf Masters ein weiteres Highlight des Multivan Summer Openings Sylt dar. 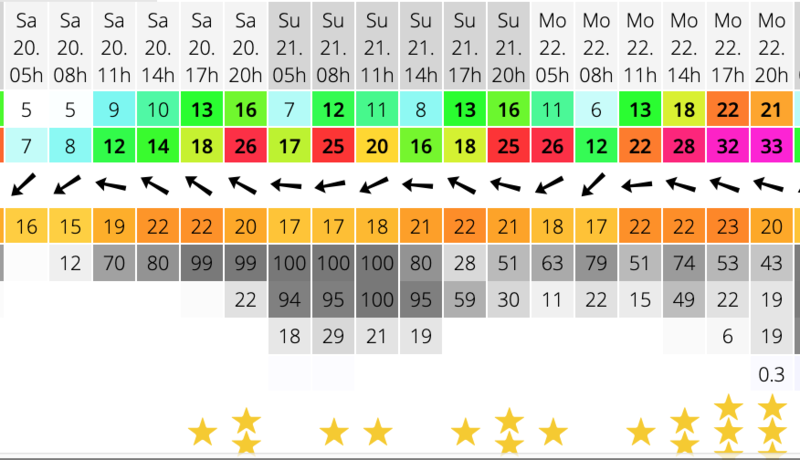 Die deutsche Kitesurfelite ist bereits am vorherigen Wochenende vom 30. Mai bis 02. Juni auf Sylt zu Gast. Die Kitesurfer werden die Zuschauer mit den Disziplinen Racing, Slalom und Freestyle in ihren Bann ziehen. Ergänzt wird die Veranstaltung durch das große Eventvillage, das den Zuschauern nahezu jeden Wunsch erfüllt. Neben einem umfangreichen Gastronomie- und Shoppingangebot bietet „Black Label Power Yoga“ tägliche Yoga Kurse zum Mitmachen am Strand. Wer seine körperliche Fitness noch weiter stärken möchte, ist herzlich zur Teilnahme am Syltfit-Bootcamp eingeladen, und wer Spannendes über die Windsurf-Profis erfahren möchte, kann dem Surfer-Talk lauschen. Der Tag klingt abends ab 19:00 Uhr bei Musik verschiedenener DJs aus. Hier darf bis in den Abend gemeinsam mit den Windsurf-Stars gefeiert werden.